If you notice this pan is different, well, it is. 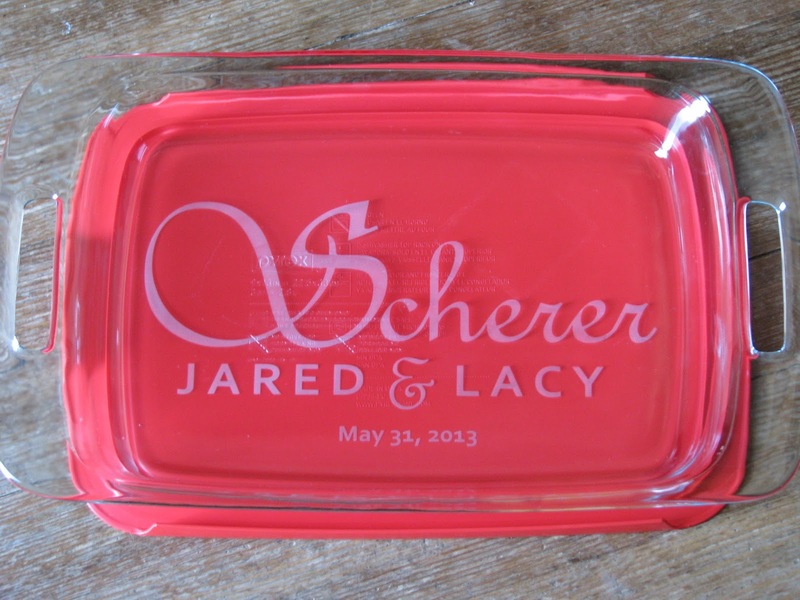 A customer brought this to me to etch for a fundraiser event. 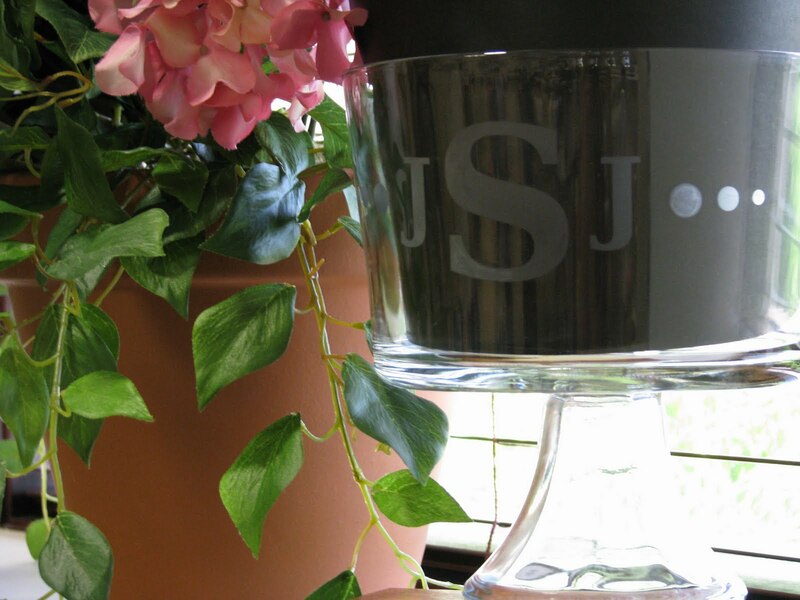 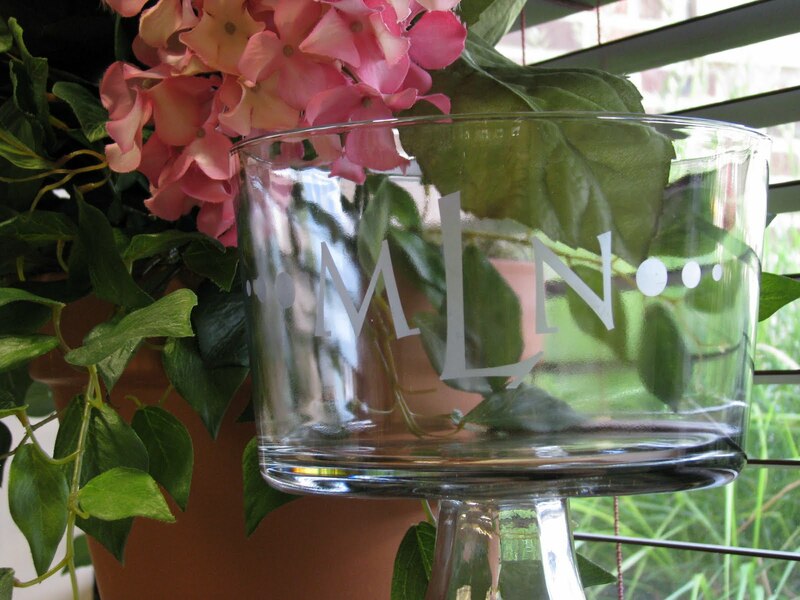 Customers are welcome to supply their own glassware. Arrangements are made on an individual basis. 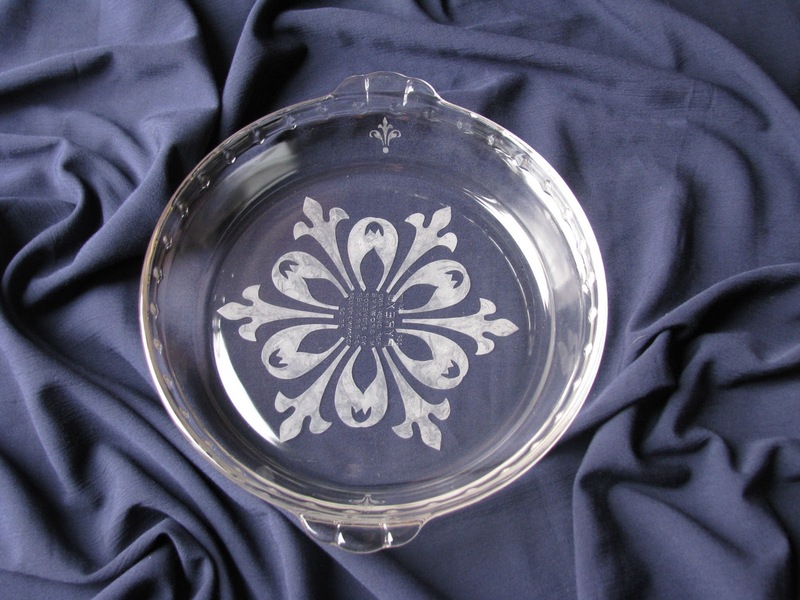 Pyrex Pie Plate, design from S-16 and the customer wanted the rolling pin with it. 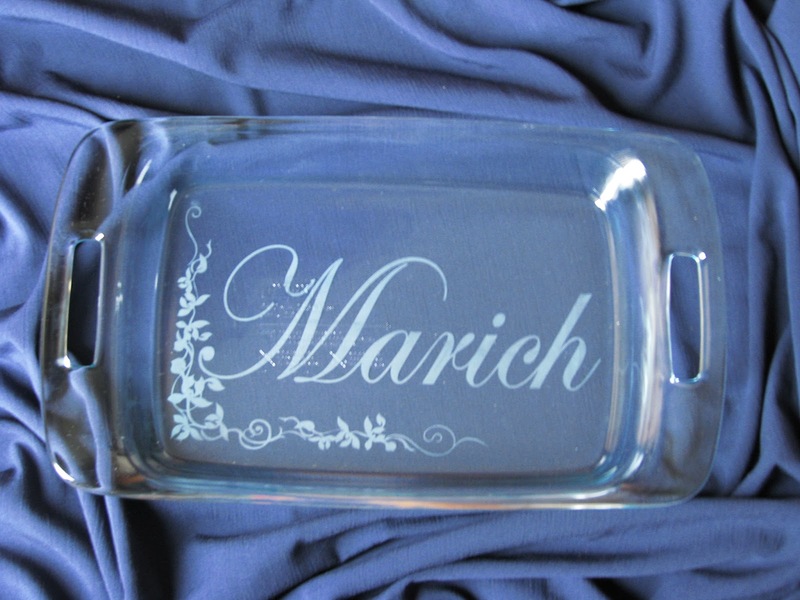 You can do a variety of things in any design. 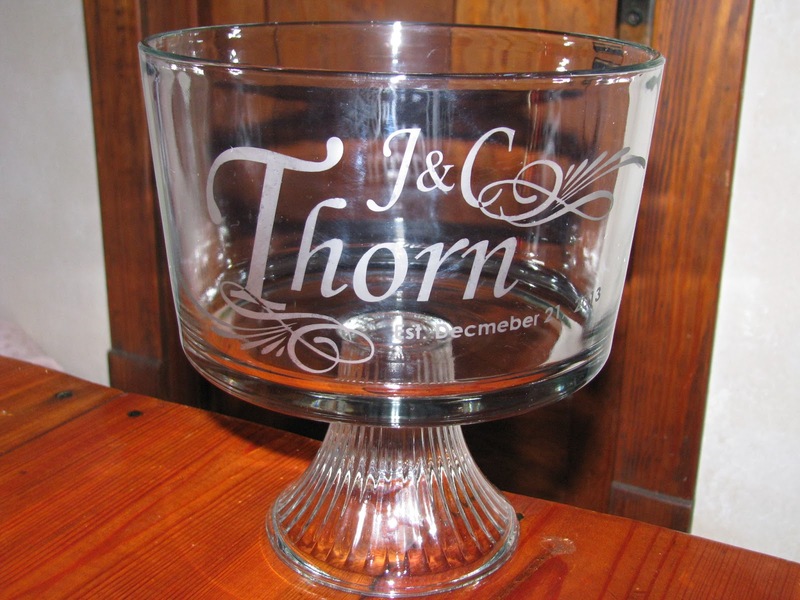 You can have first names; first names and/or last name. 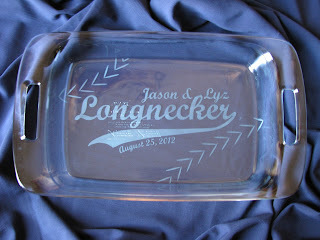 Date is also optional. 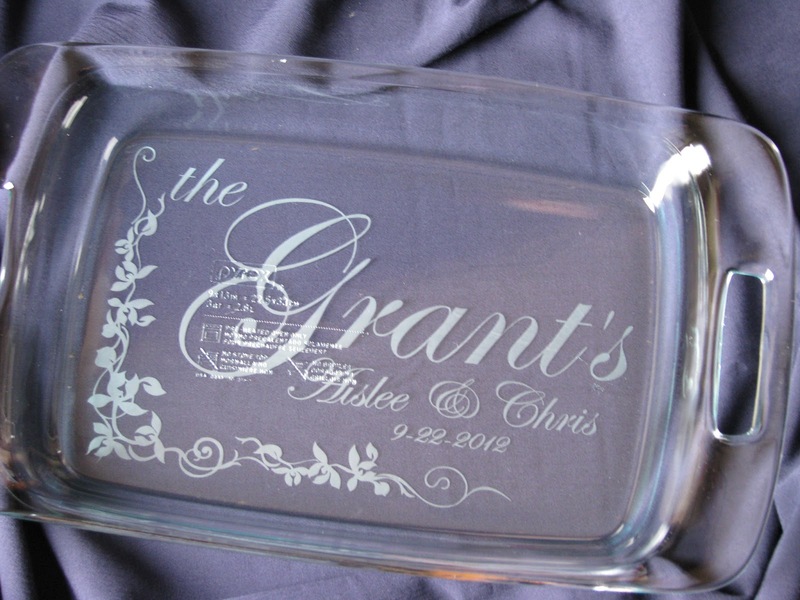 You can design it however you like. 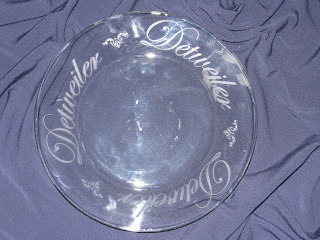 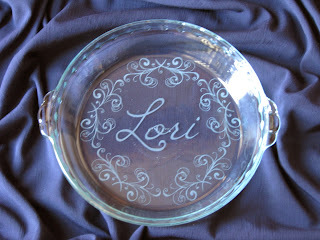 Pyrex Pie Plate, R-1 font with EM010 embellishment. These pie plates were gifts for wedding hostess couples. 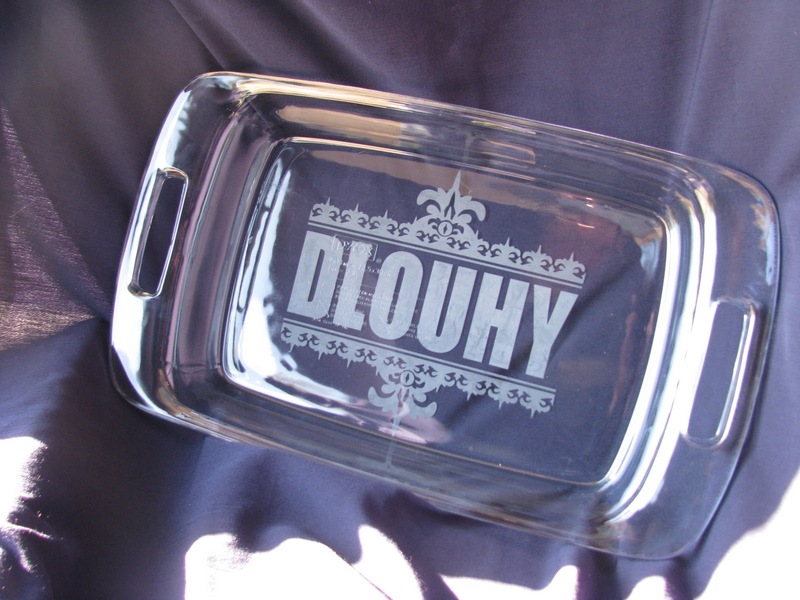 9x13 Pyrex with lid, design S-1. 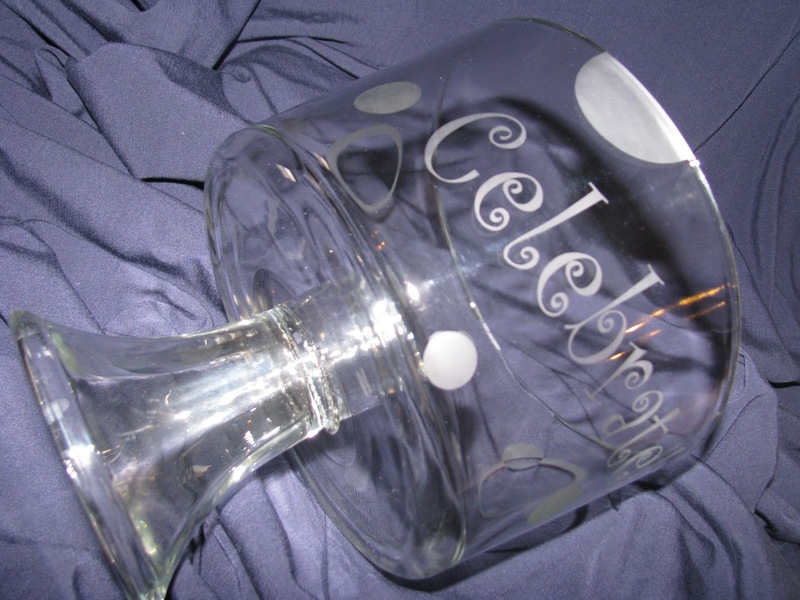 The design R-40 includes first names with or without date. 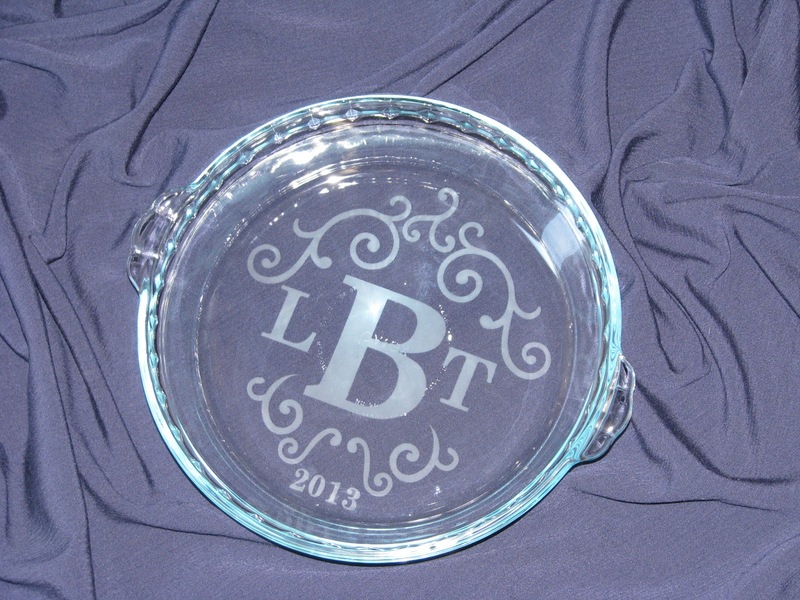 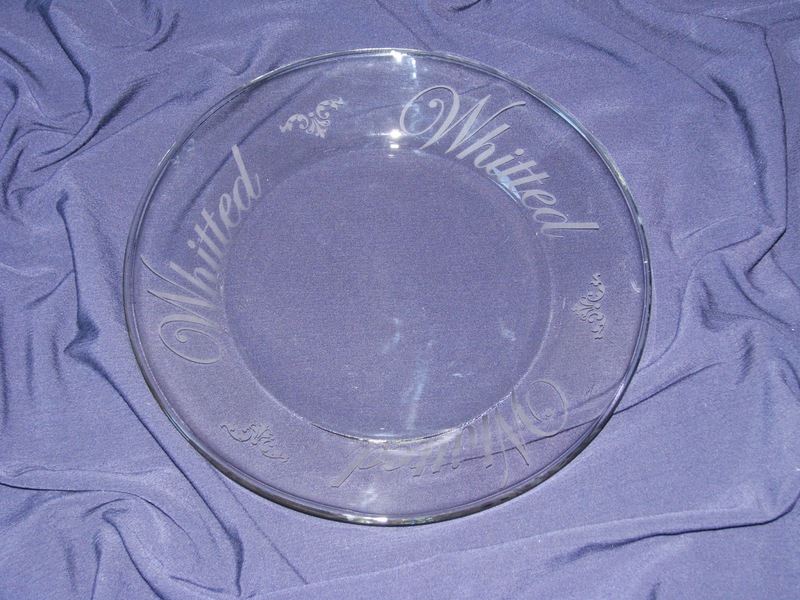 This trifle and pie plate were ordered together as a wedding gift. 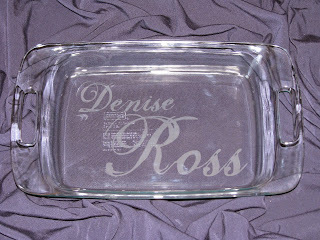 (design R-36) In the past this design has only been done on a 9x13 Pyrex with lid. 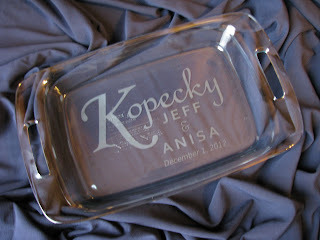 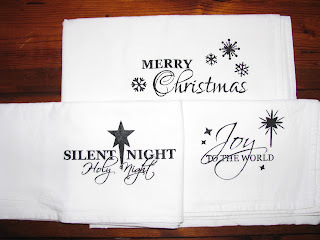 I thought this was a fabulous idea, and love how they turned out, especially on the pie plate. 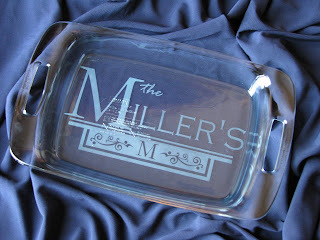 What a great idea for any baseball fanatic! new Made with Love design. 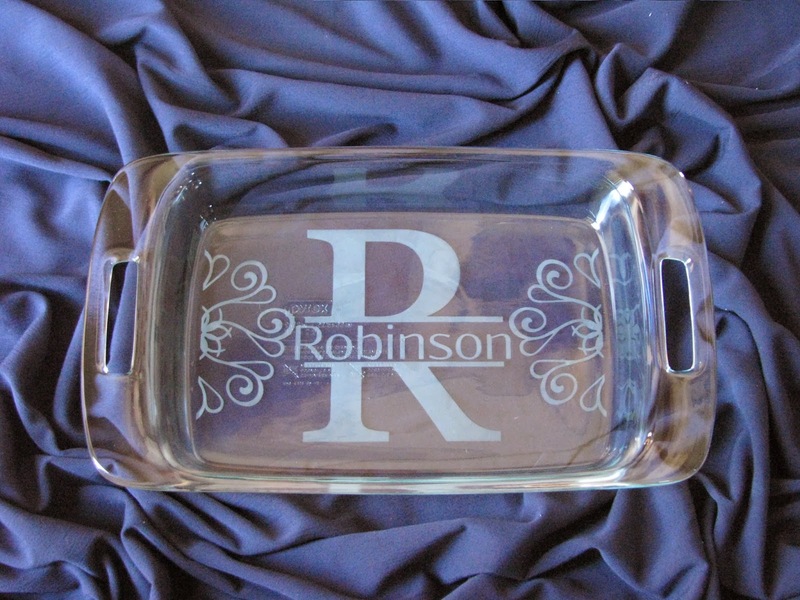 Added "Robinson" per customer request. 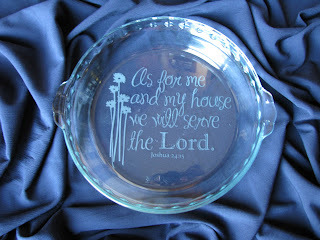 even though it's not photographed with one. 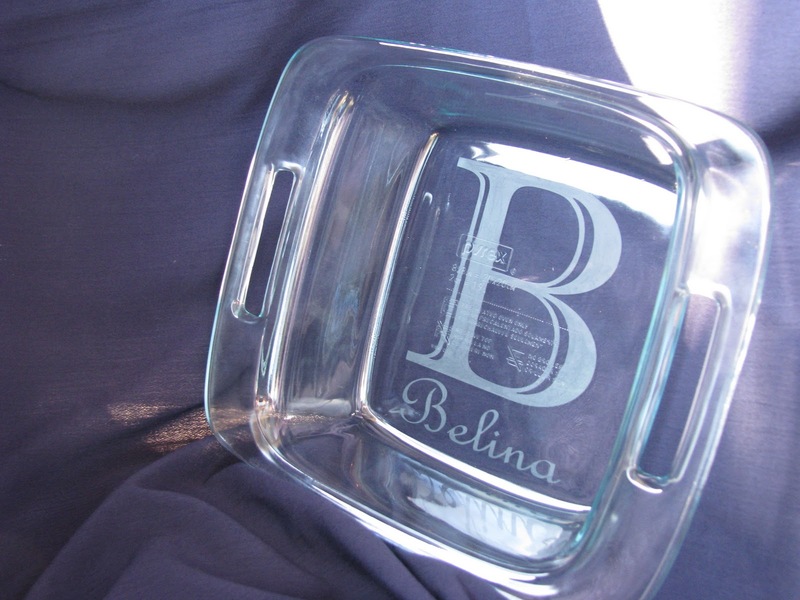 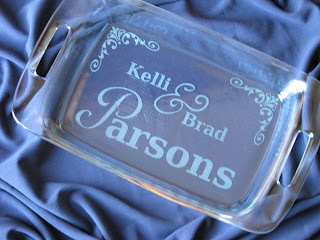 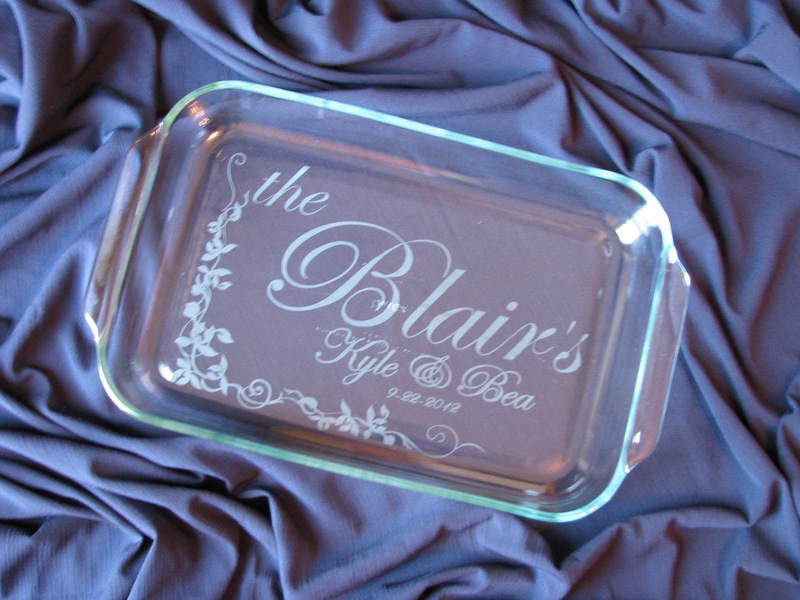 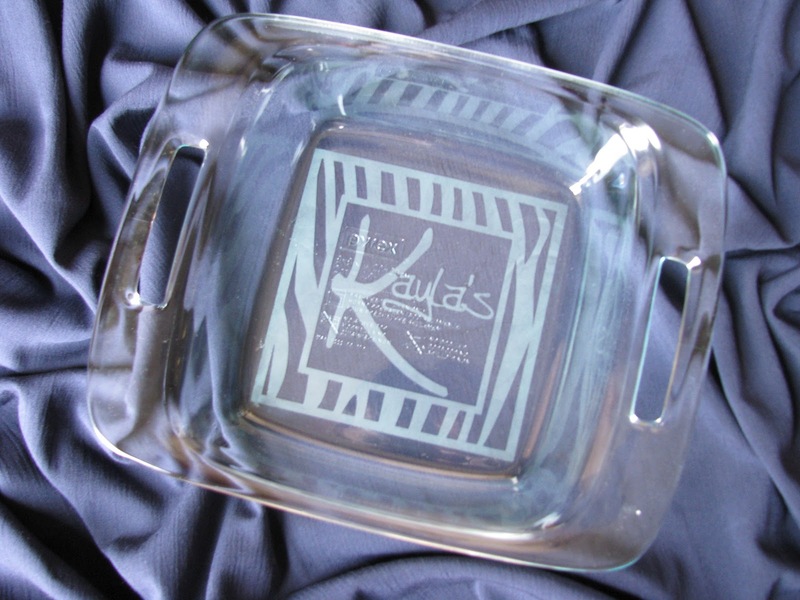 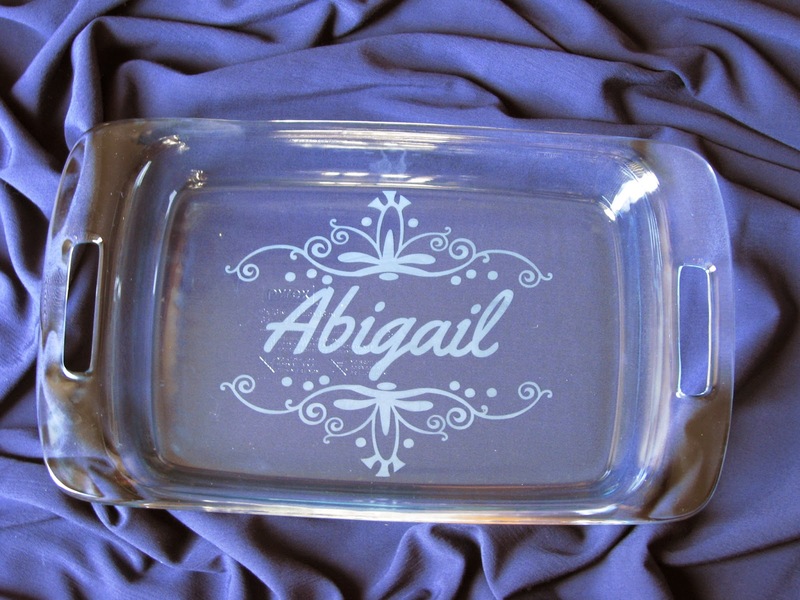 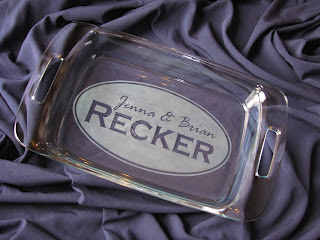 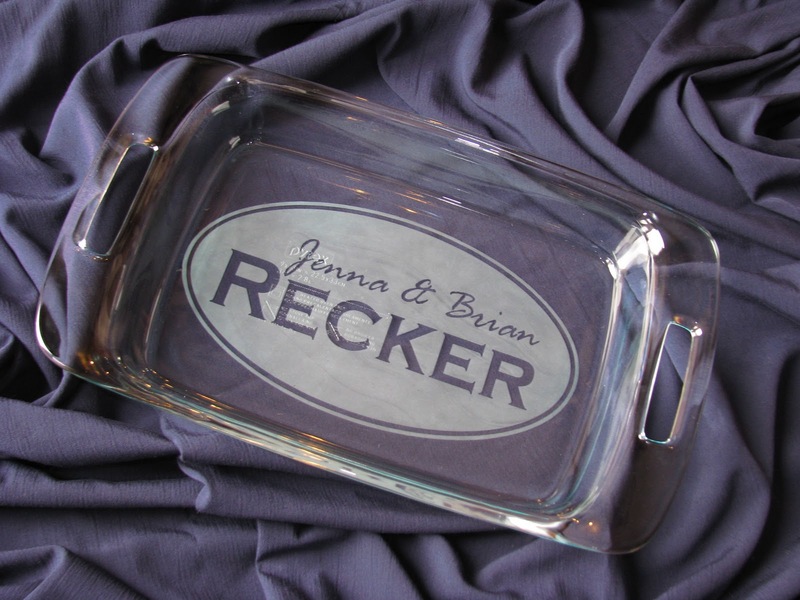 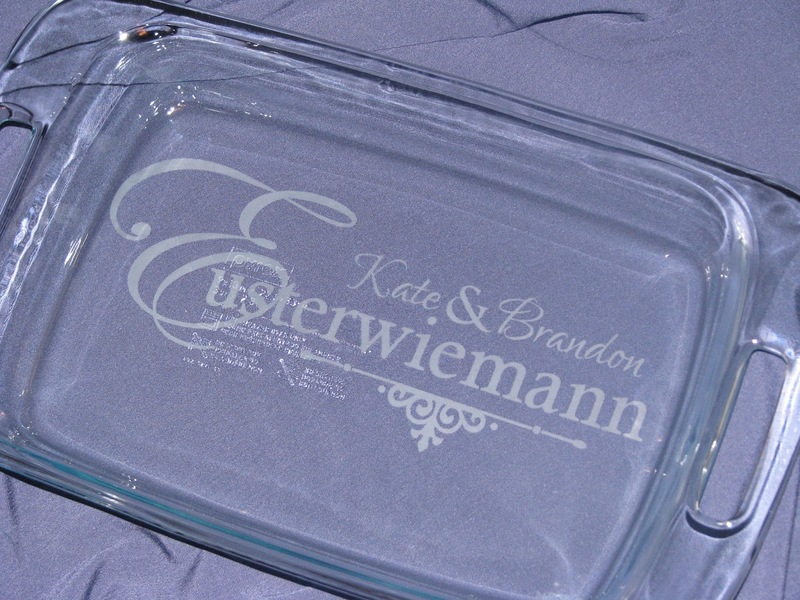 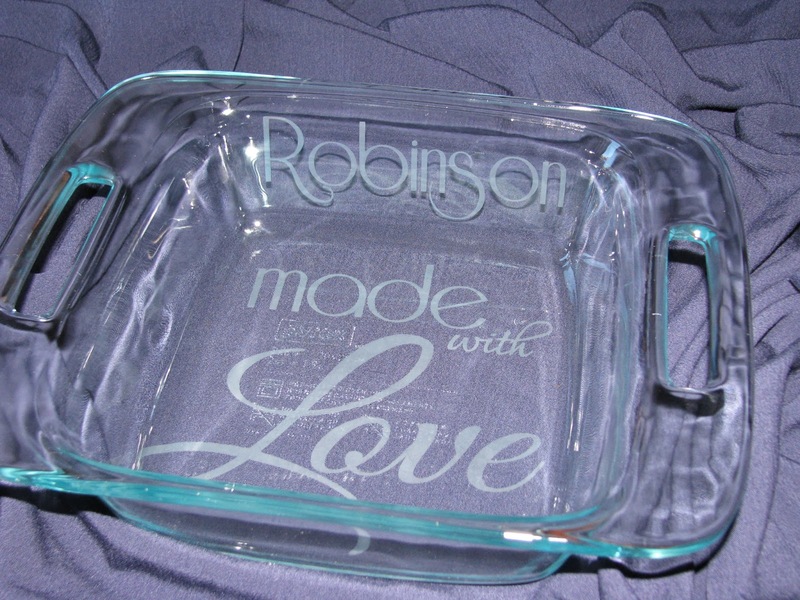 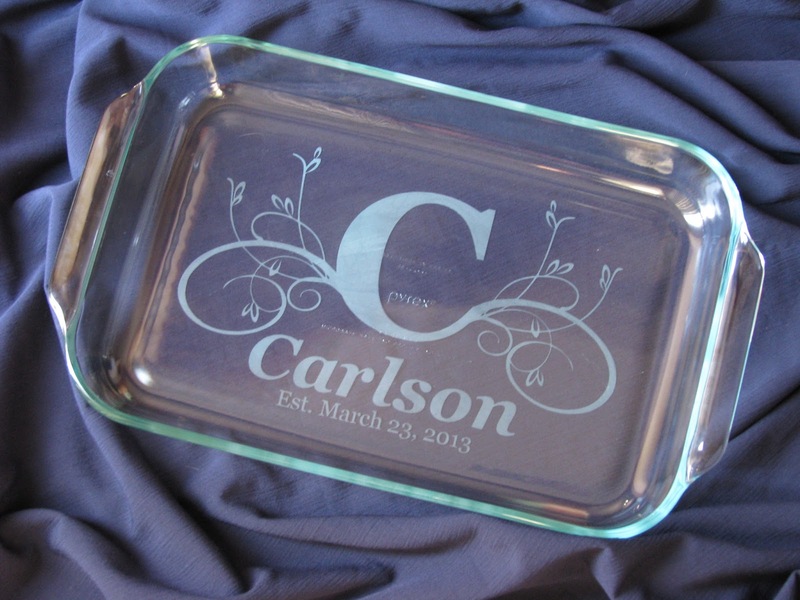 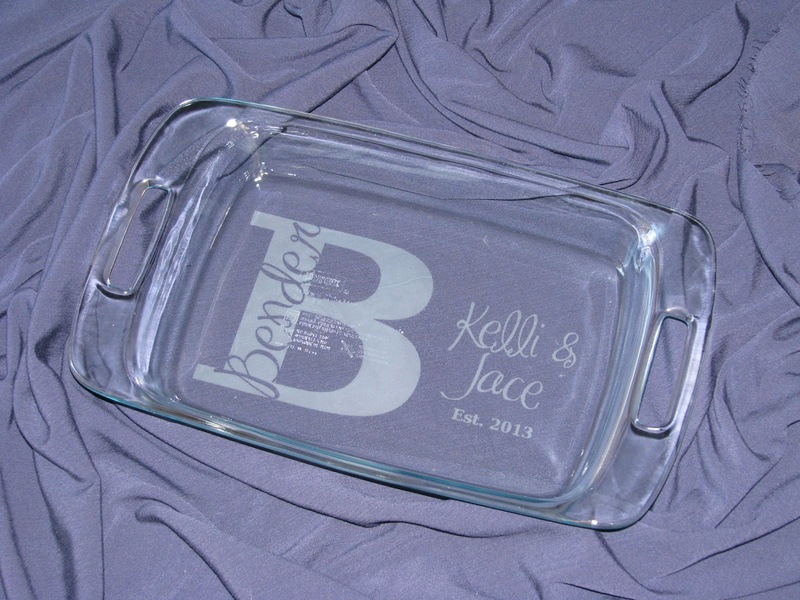 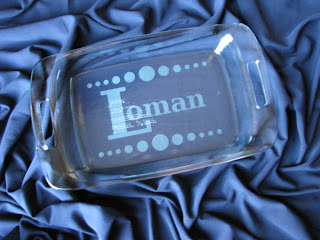 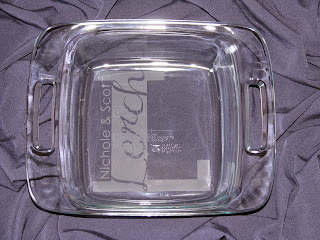 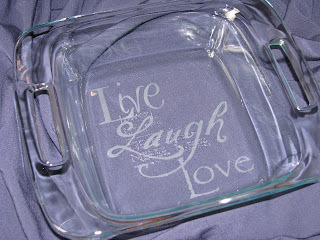 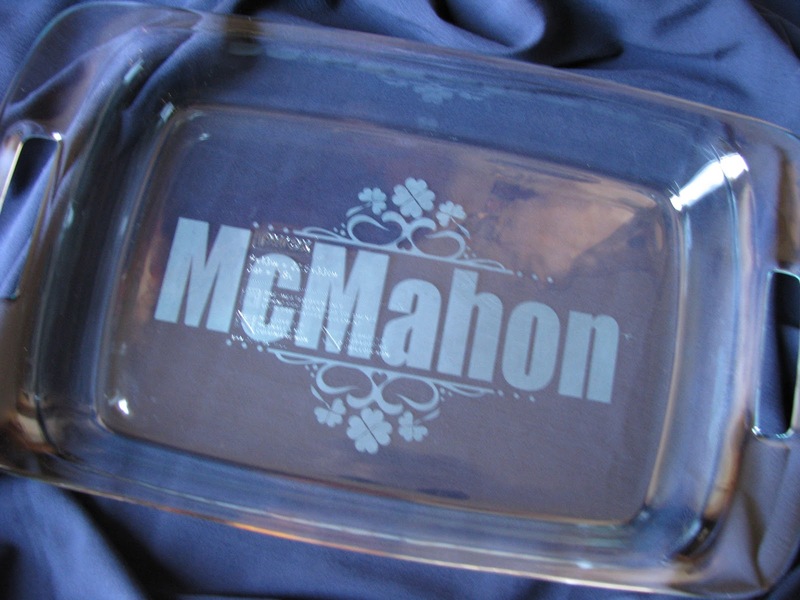 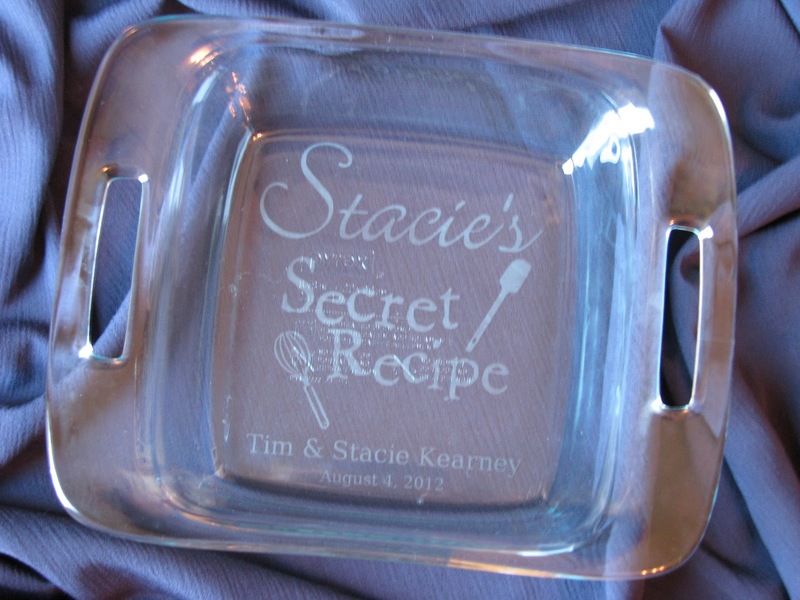 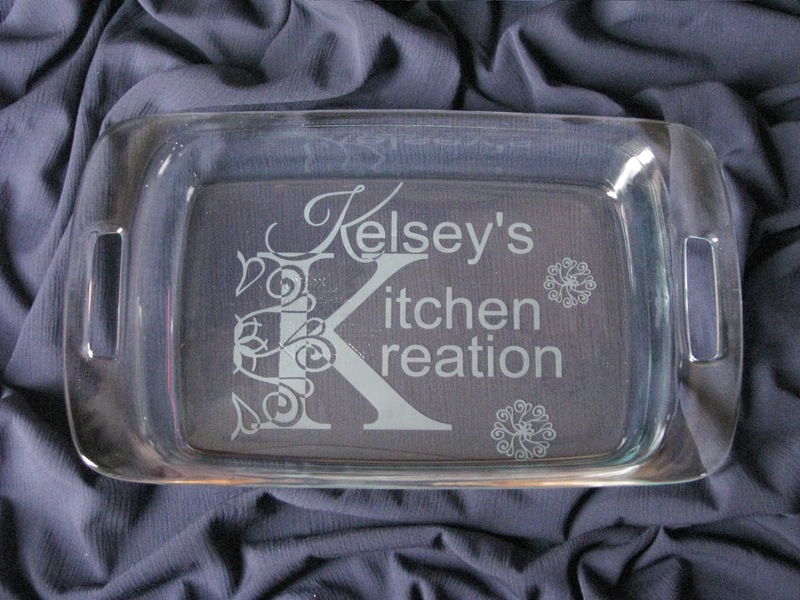 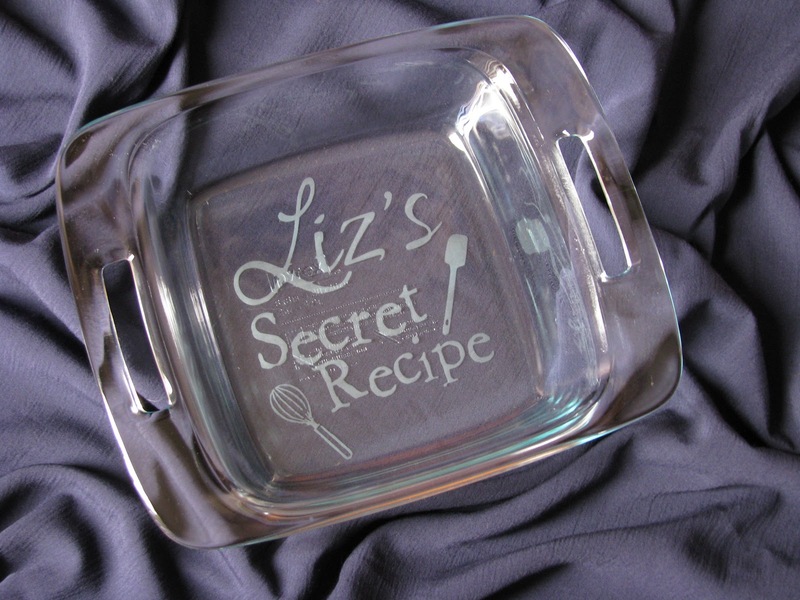 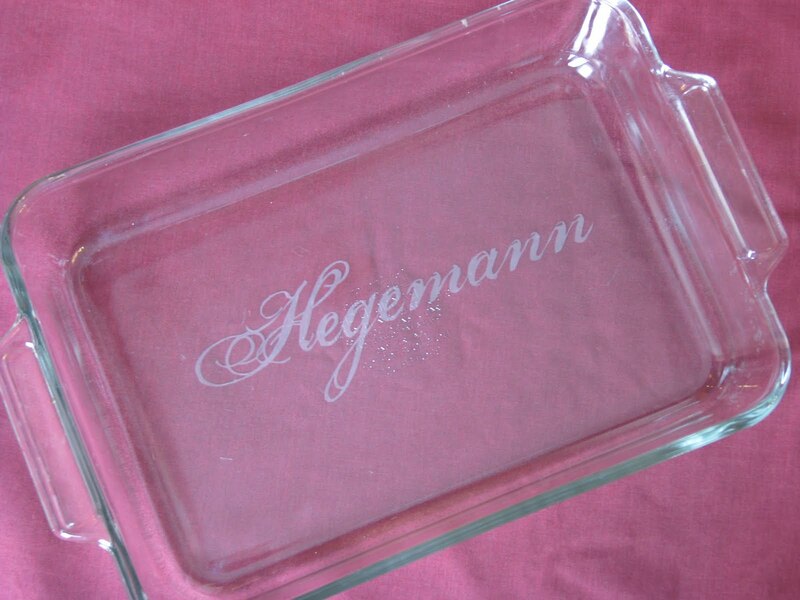 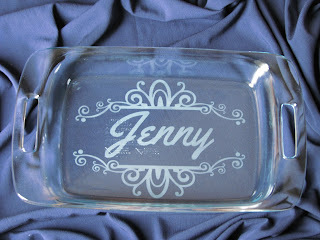 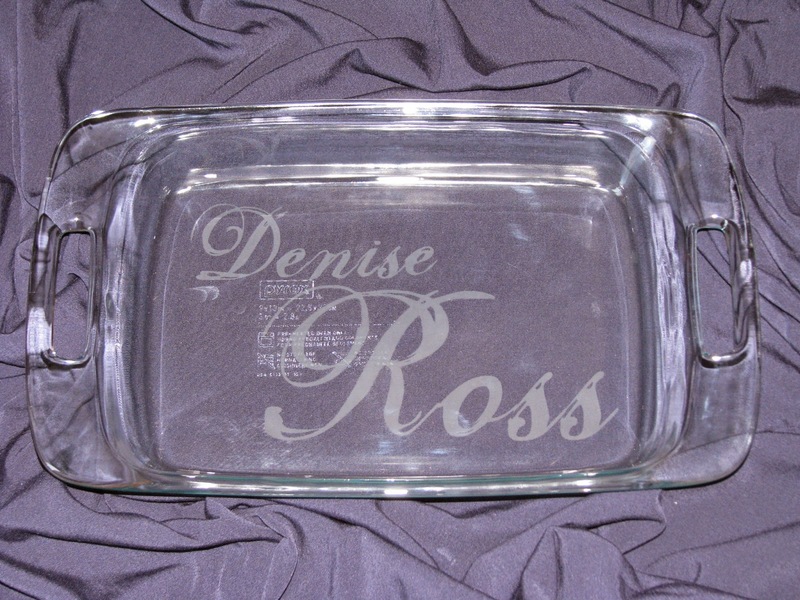 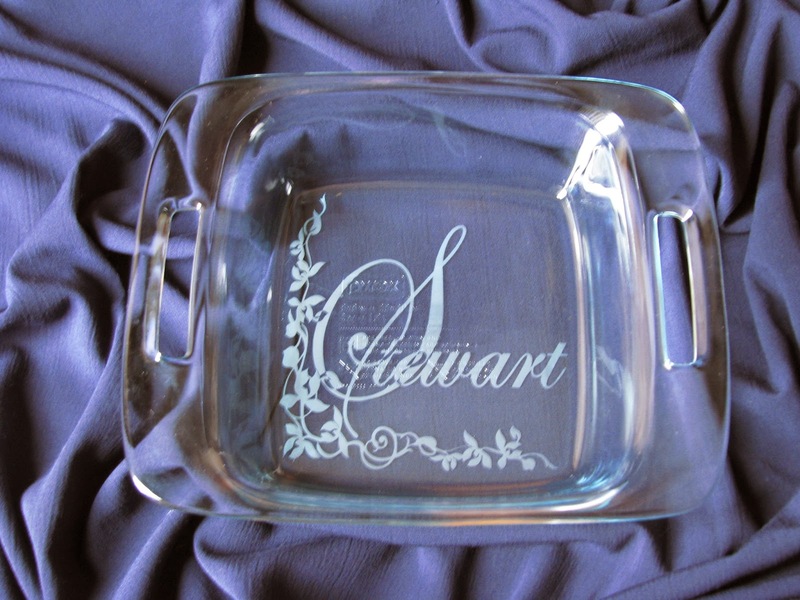 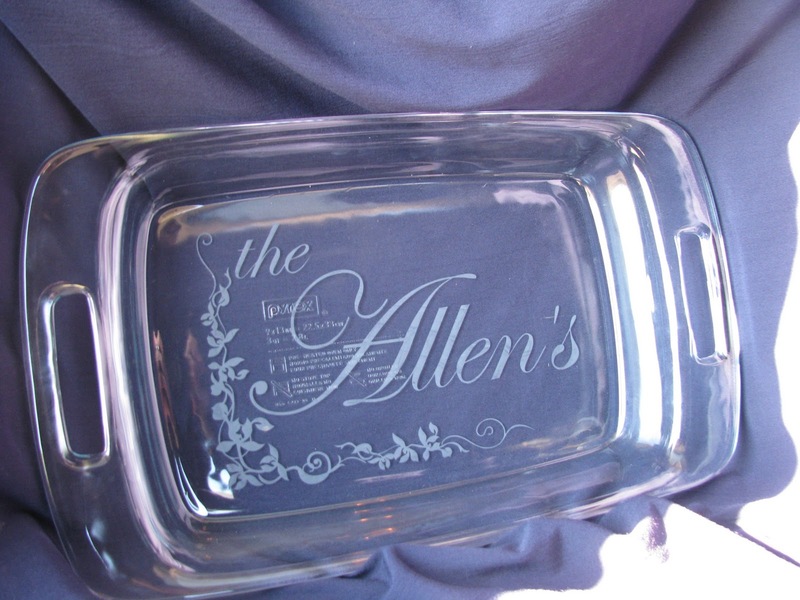 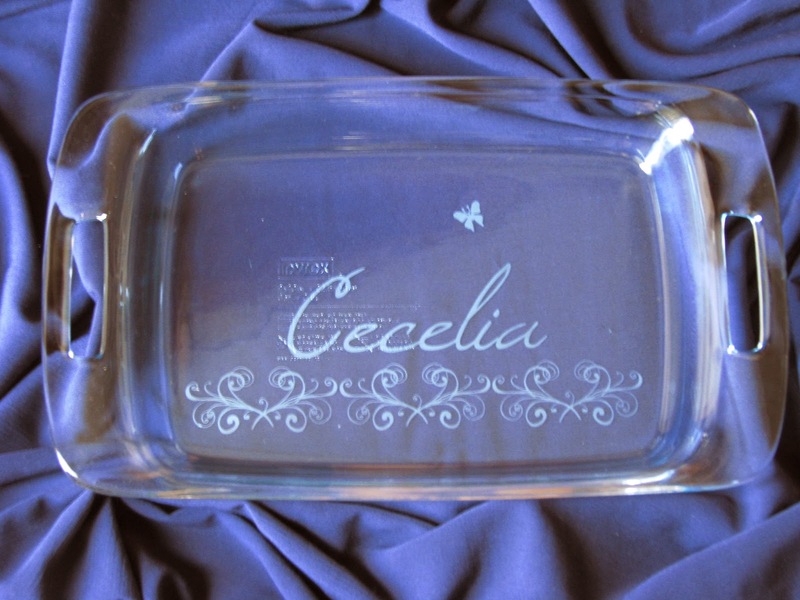 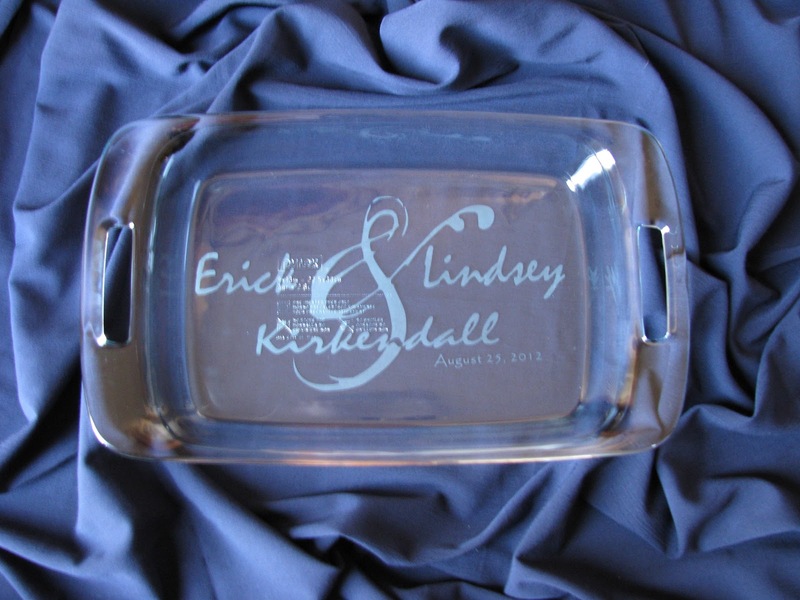 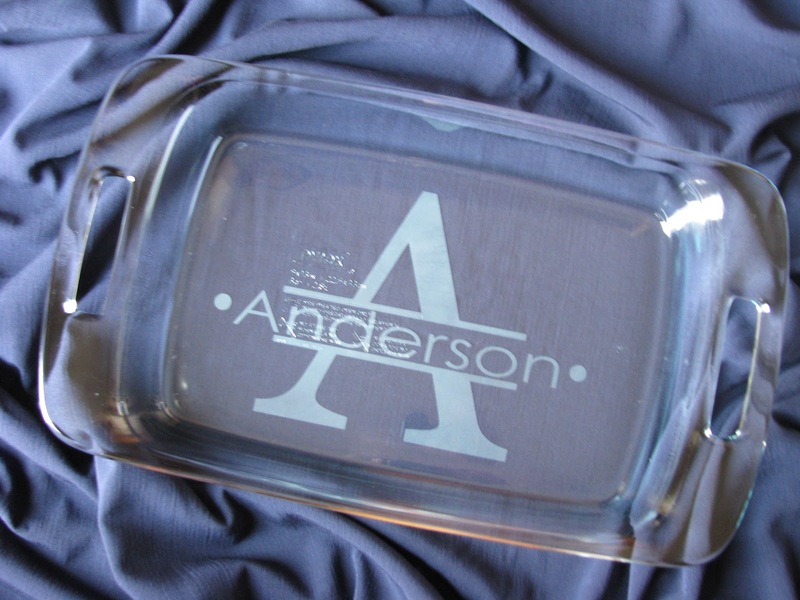 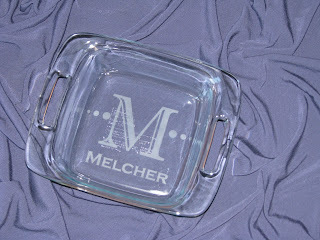 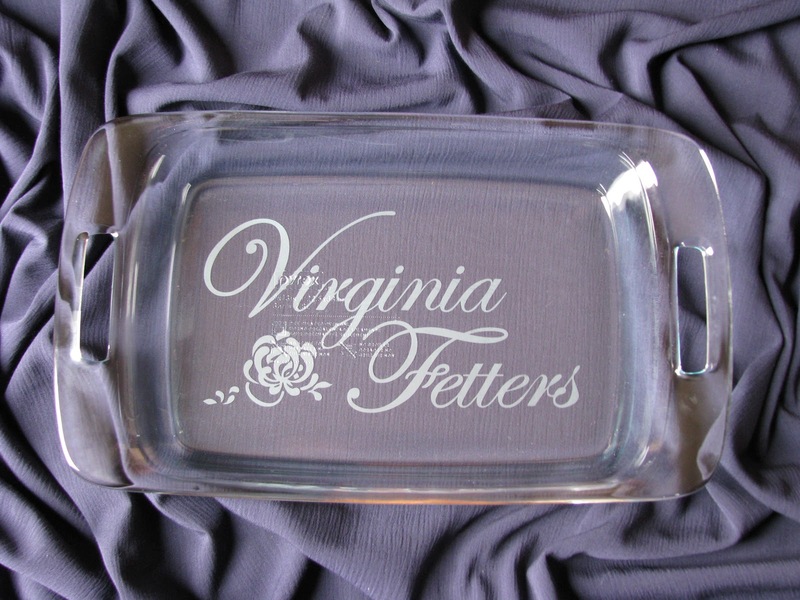 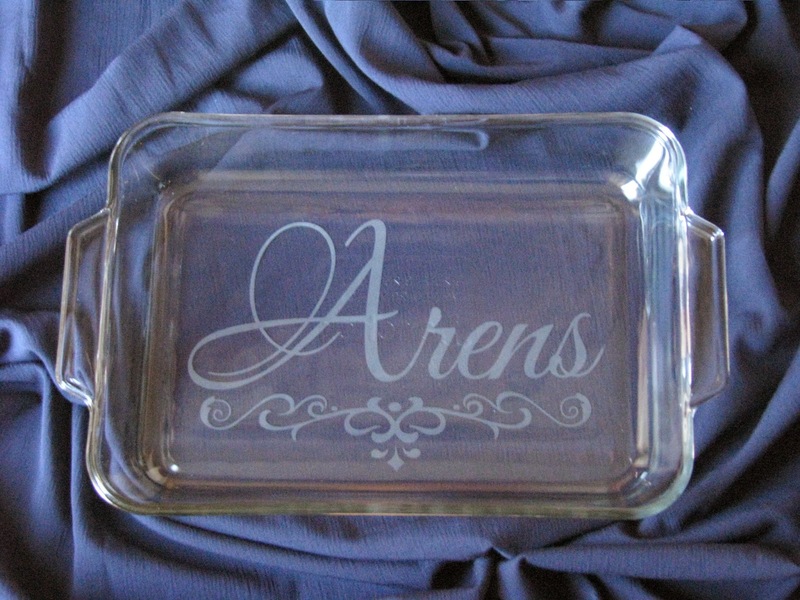 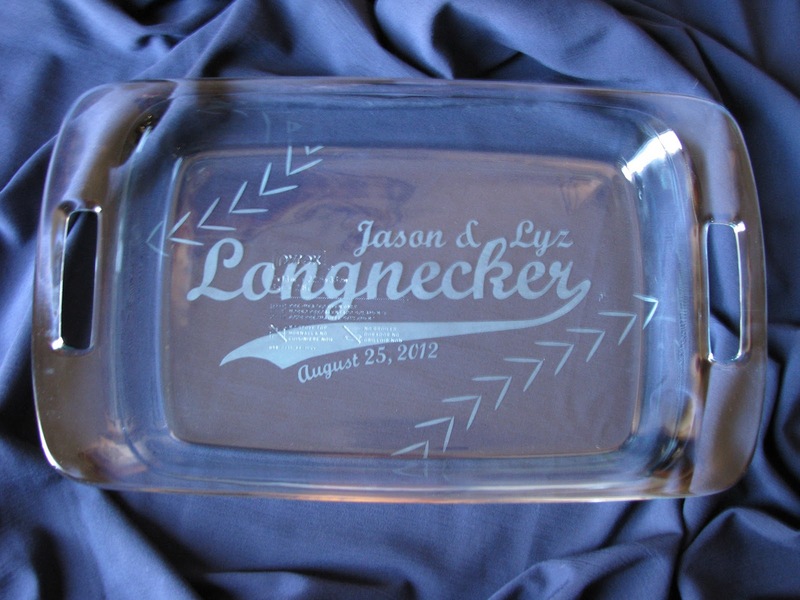 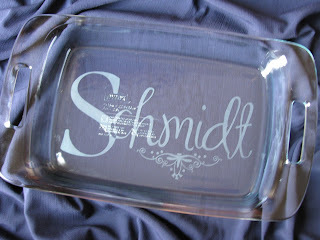 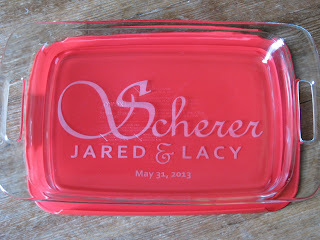 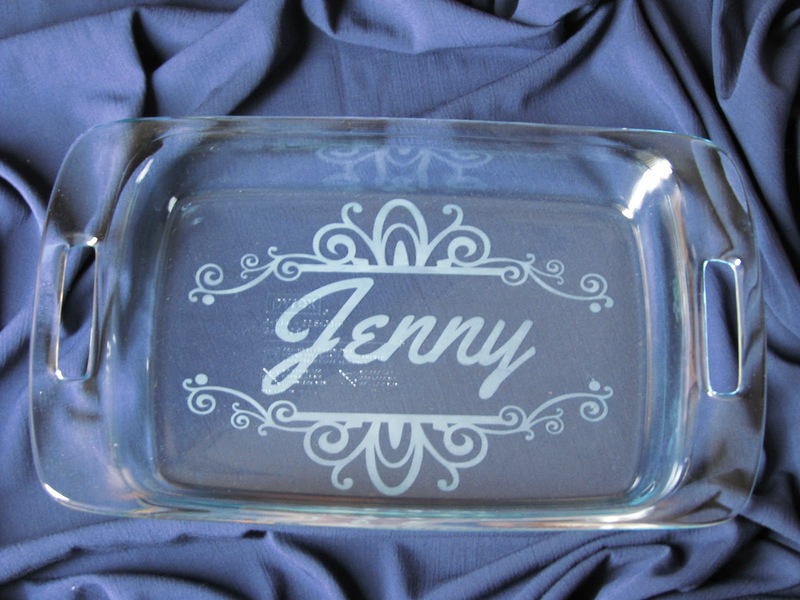 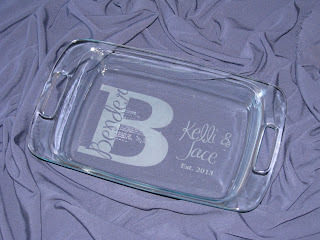 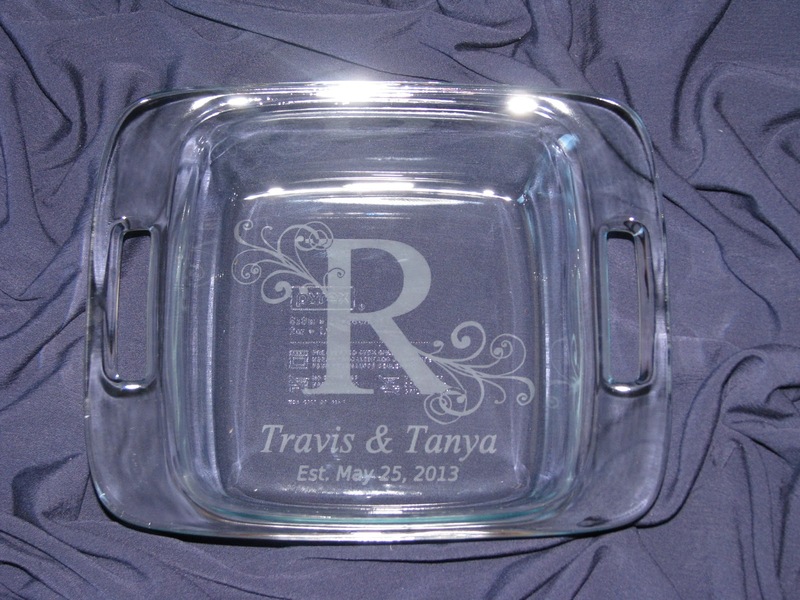 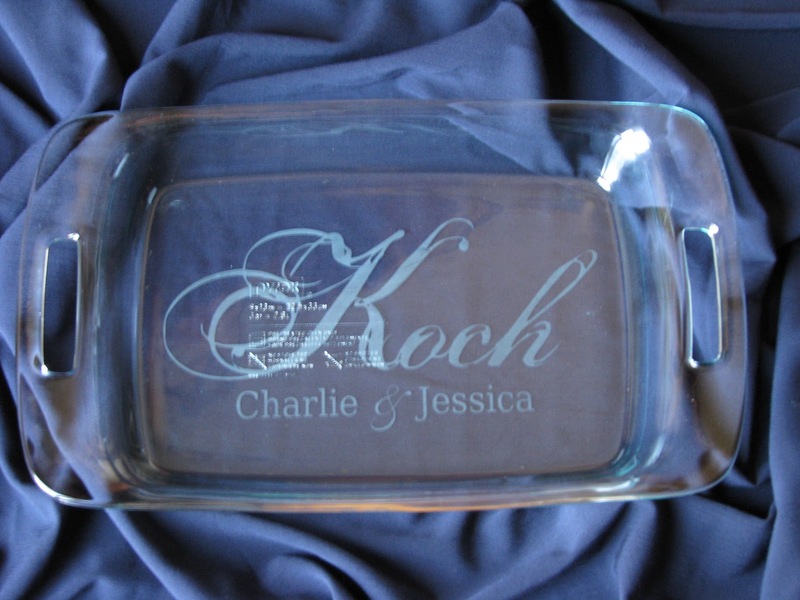 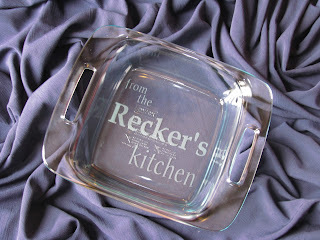 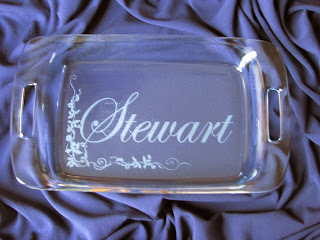 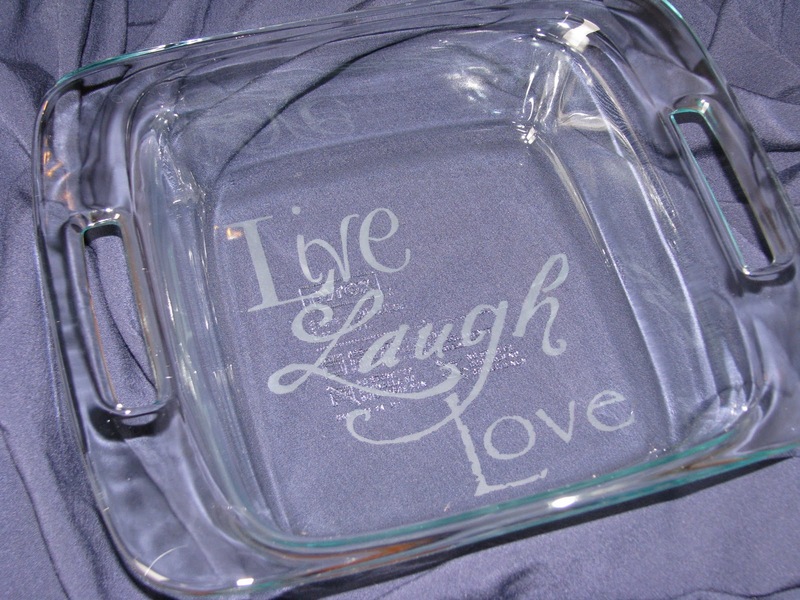 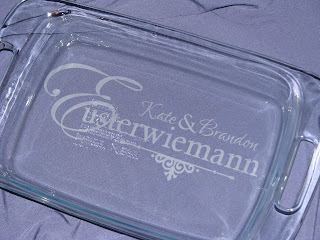 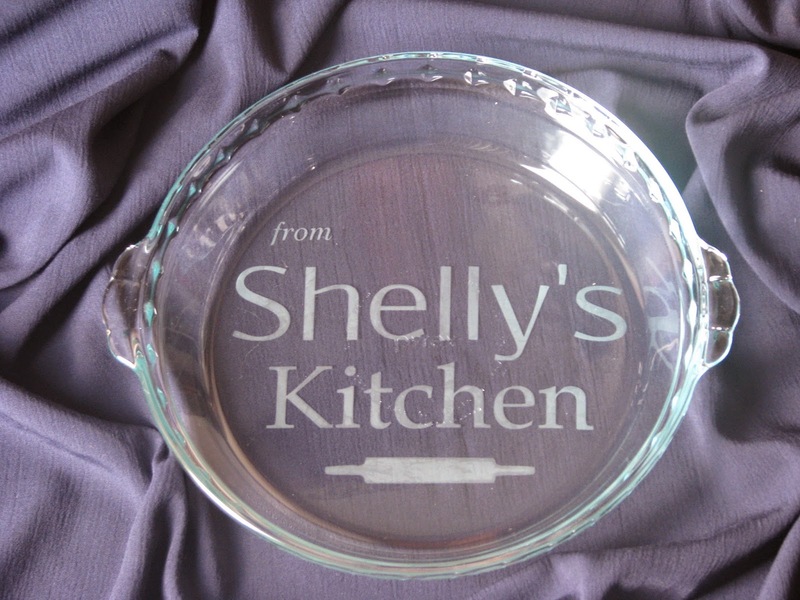 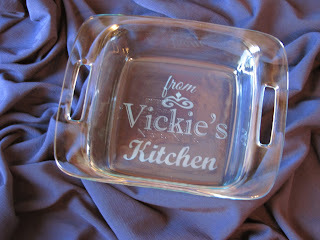 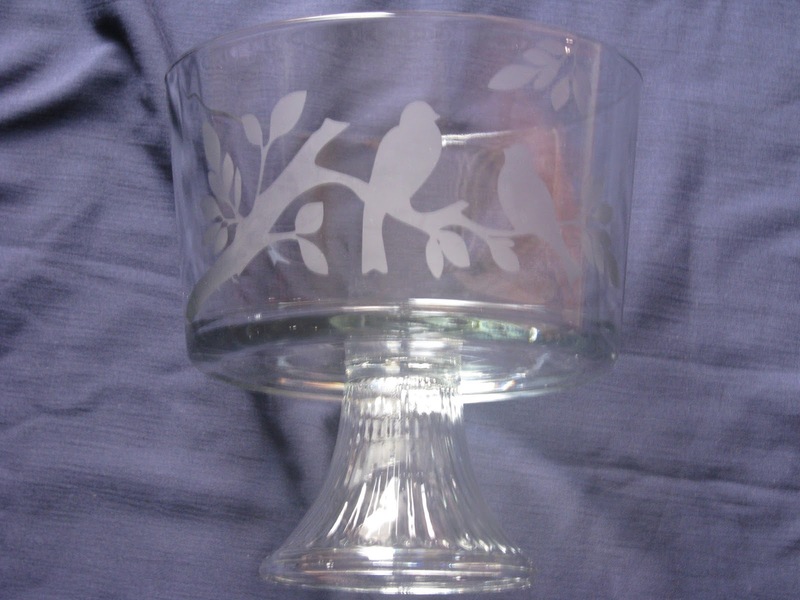 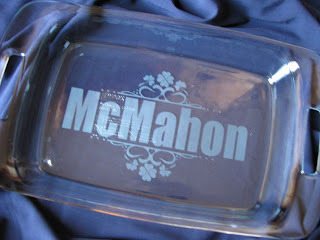 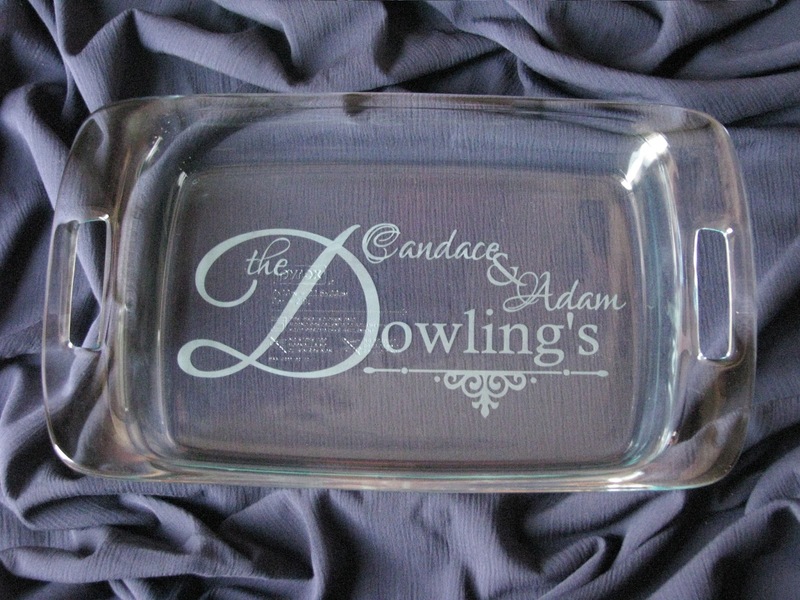 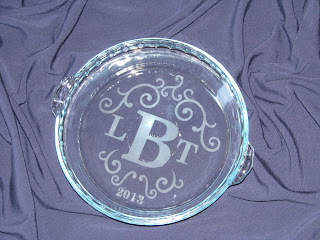 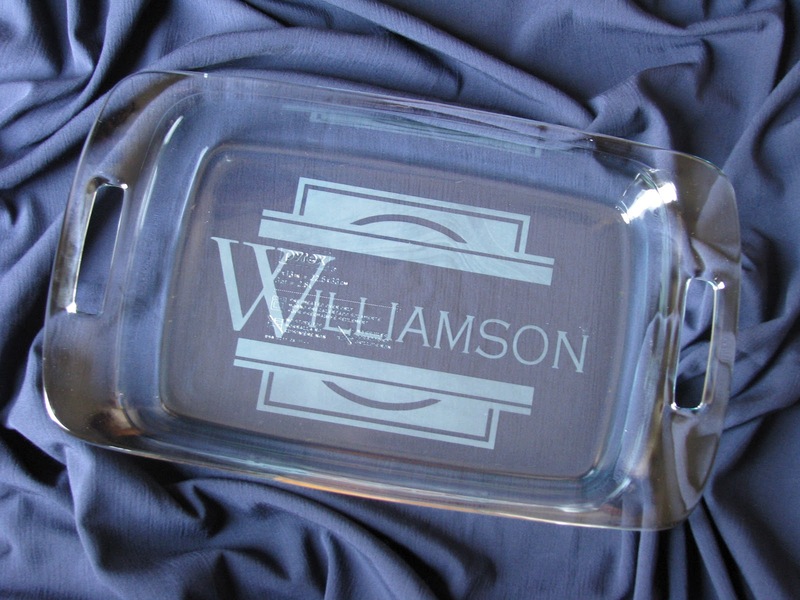 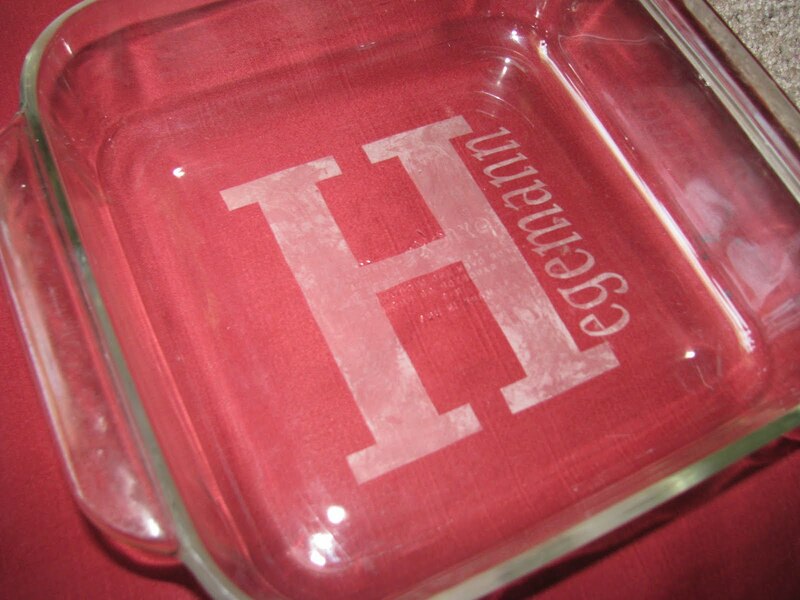 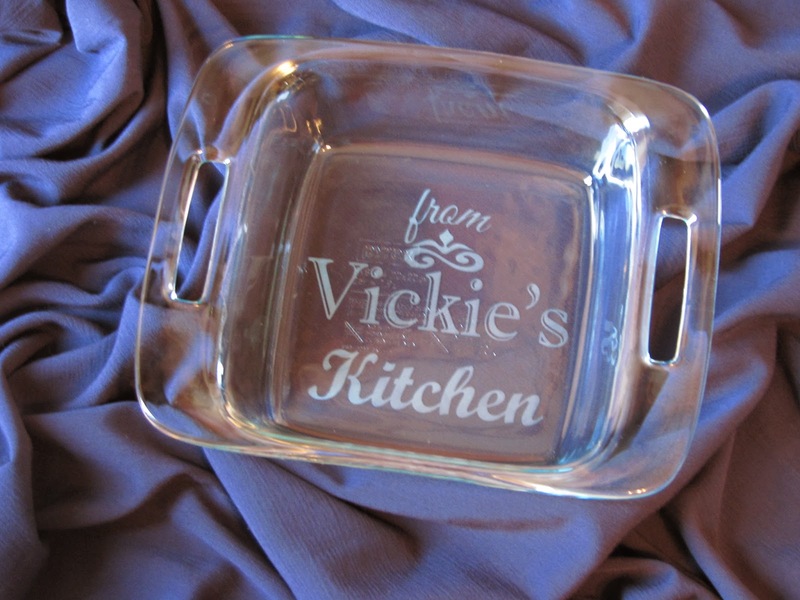 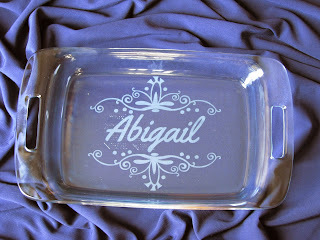 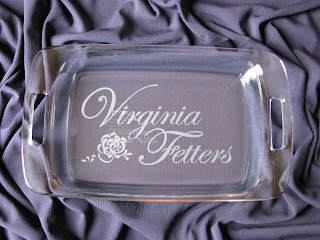 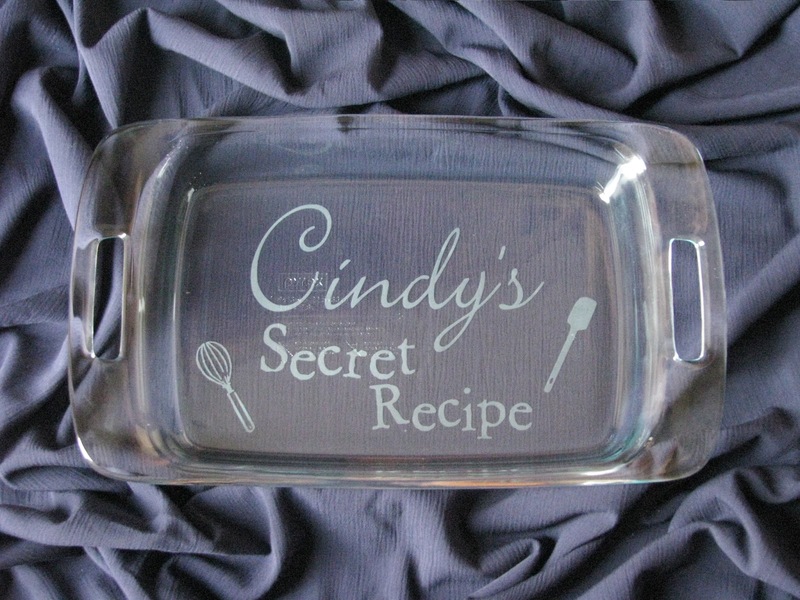 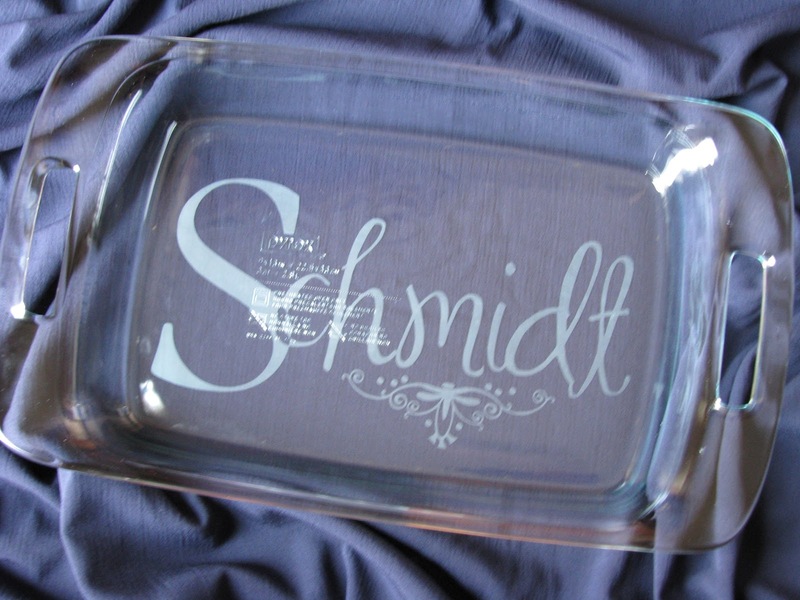 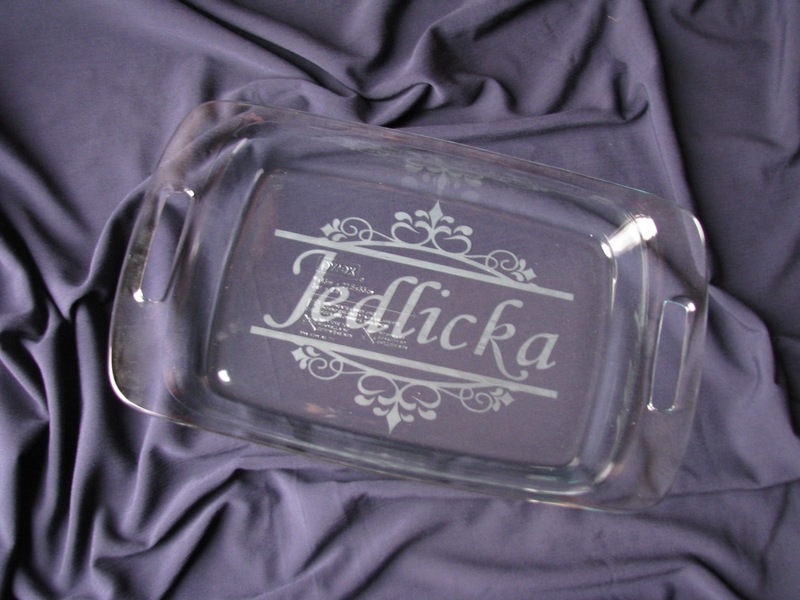 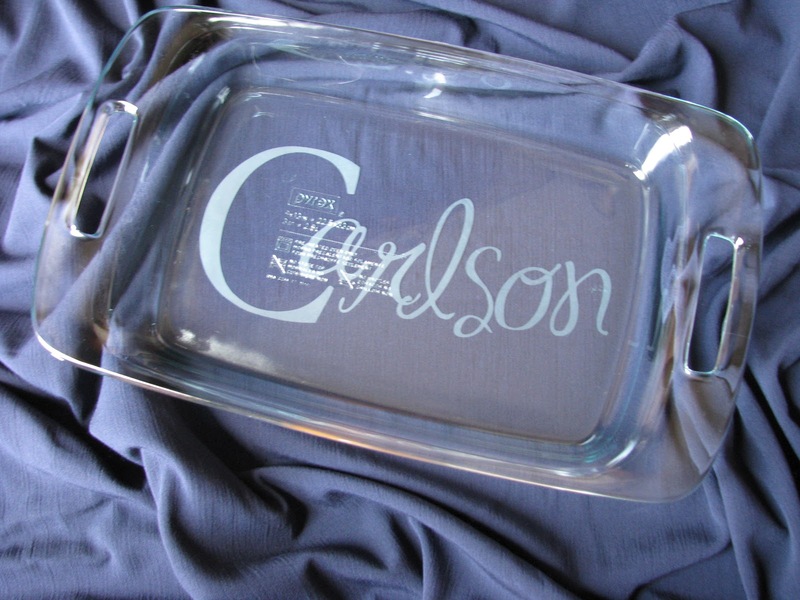 8x8 Pyrex, R17, modified this one by enlarging the S.
Think about getting matching/coordinating dishes for a gift. 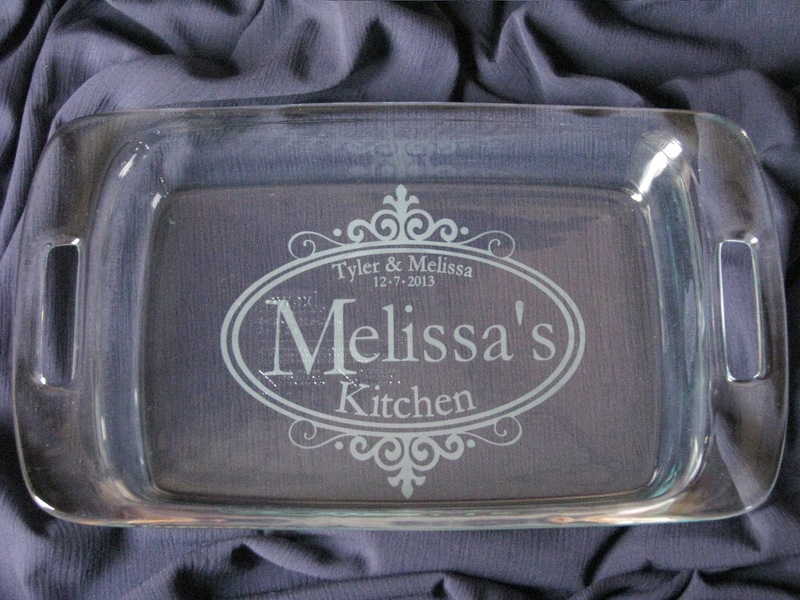 9x13 Pyrex, designed per customer request. 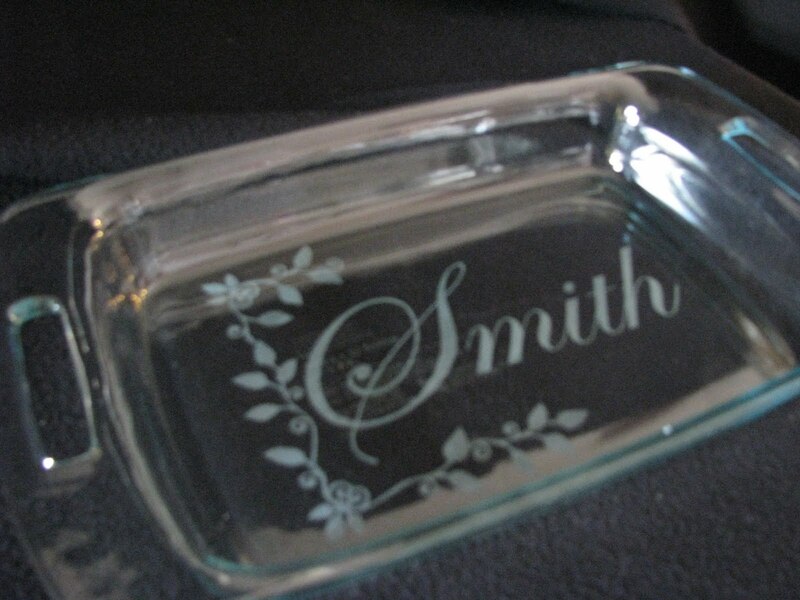 9x13 Pyrex, embellishment with name. 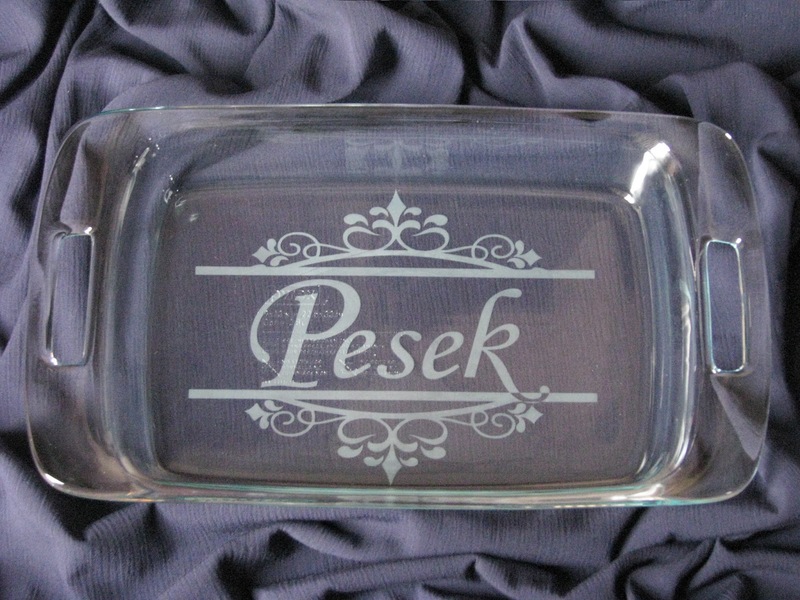 8x8 Pyrex, random design, not yet with a design code. 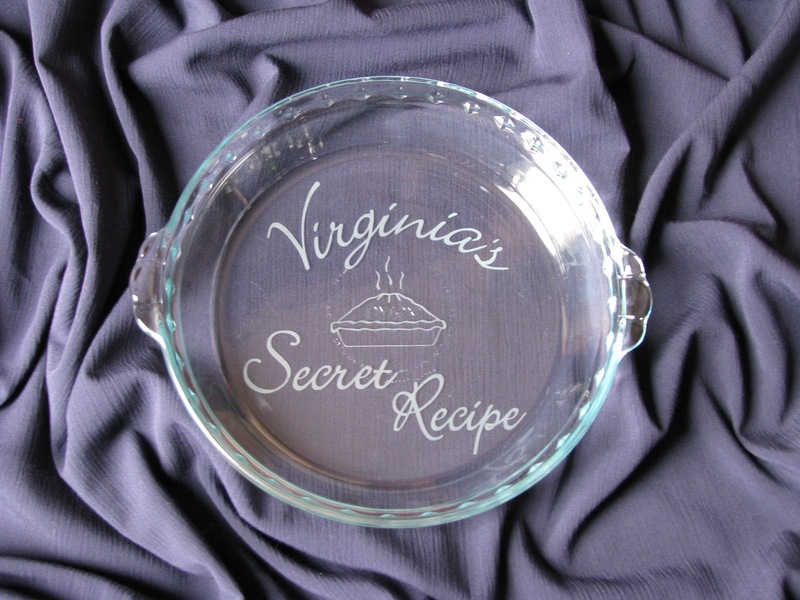 Pyrex Pie Plate, custom design by customer request. 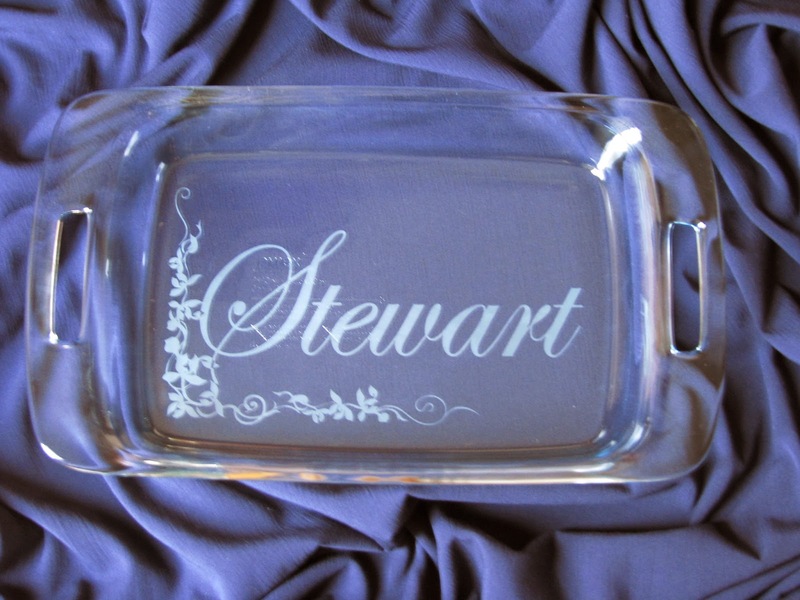 R-34 - 9x13, The 2013 can also be the first initial of the last name, or the first name of one person if we decide not to put it above, or something else. 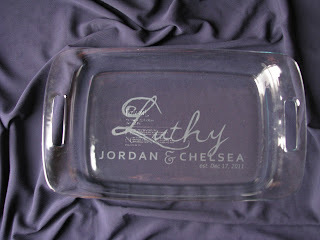 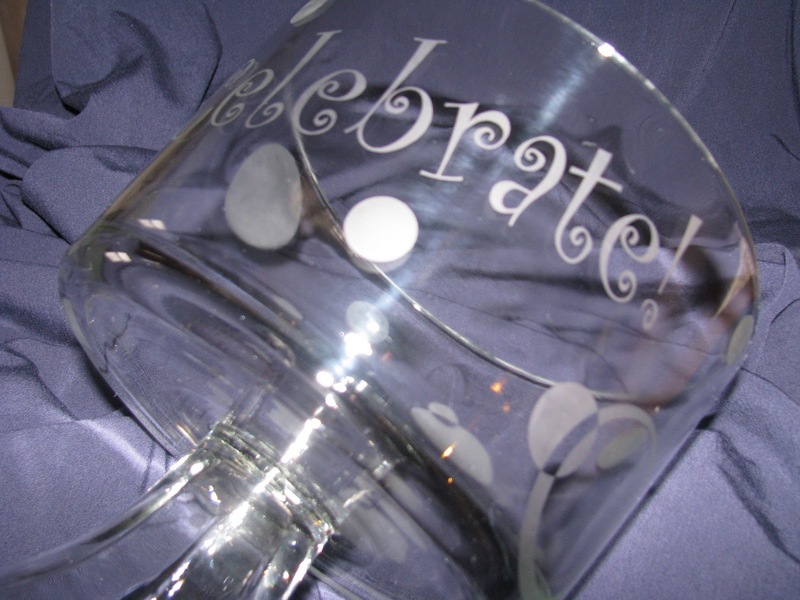 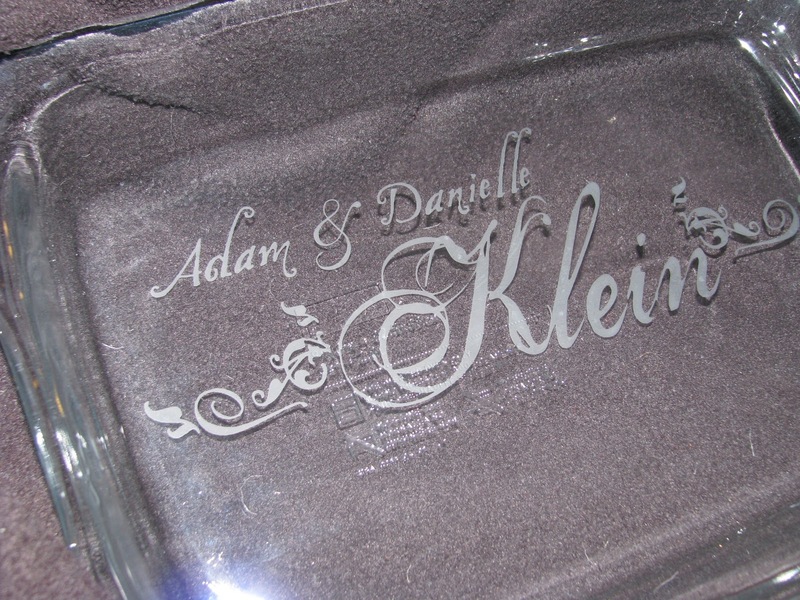 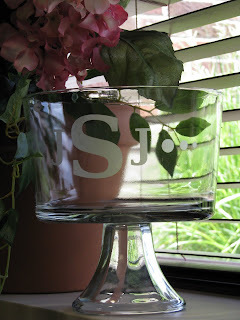 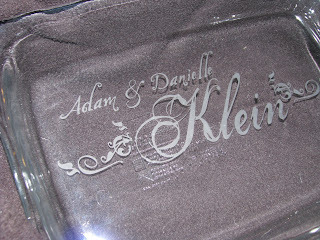 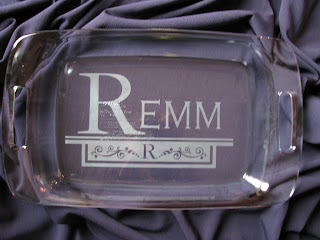 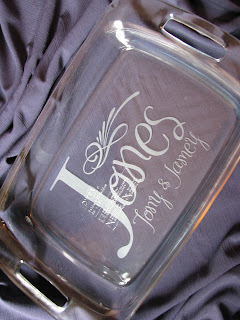 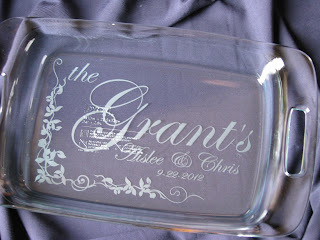 R-25 - This customer wanted to monogram of the couple instead of the last name. There are options with every design, it just depends on what you want. 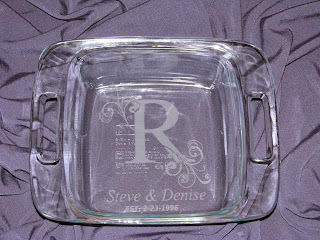 I think this started out as S-16, but changed it to what the customer wanted. 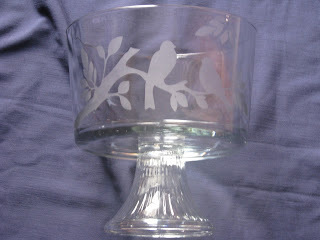 M-13 - Two birds on a branch. 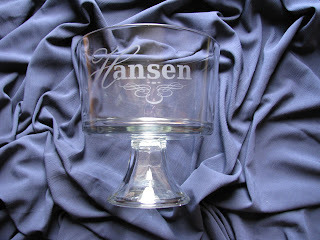 R-48 - 9x13, yes it is possible to do really long last names. 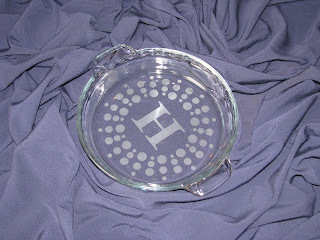 This one has 13 letters. 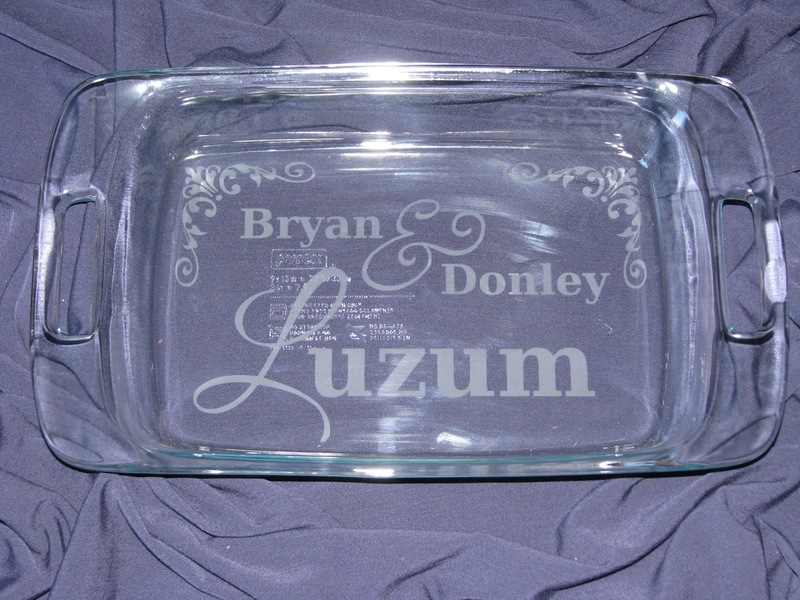 No we don't charge by the letter, I don't think that's fair to those of us with long last names. S-1 modified to include first and last name. 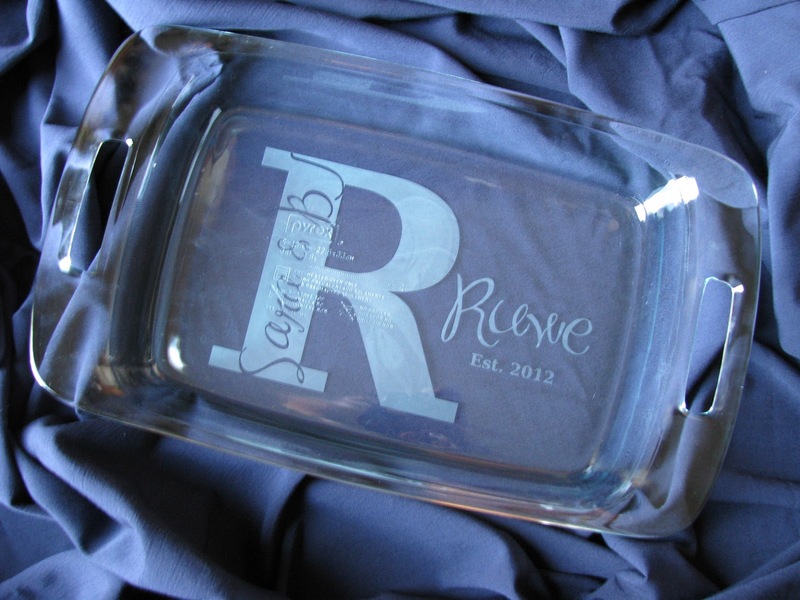 R-3, modified to include date. Depending on the letters in the name, this sometimes determines placement of first names and date. R-22, with modification of the first letter. 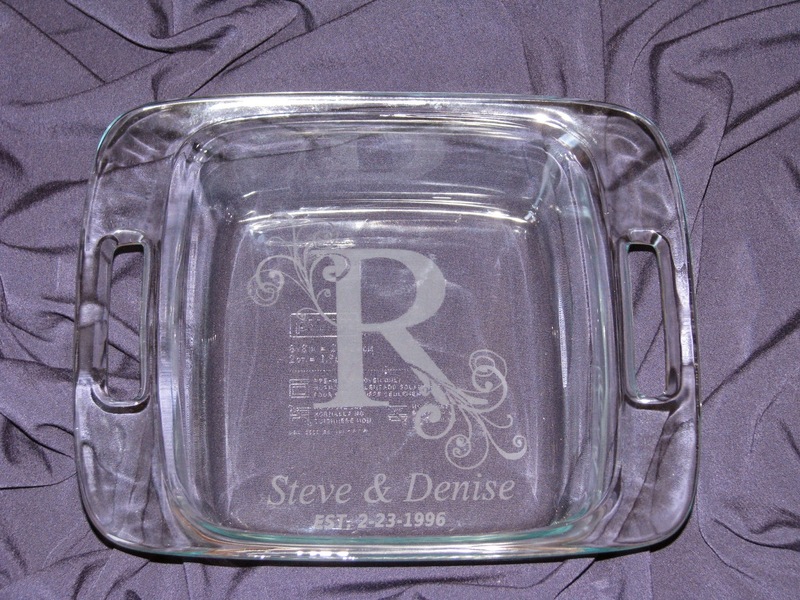 R-12, first names and dates can always be added or deleted. 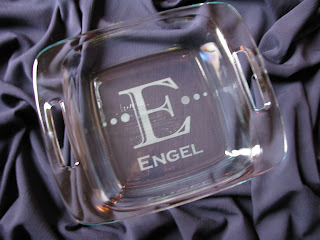 trial...let me know if you like it! 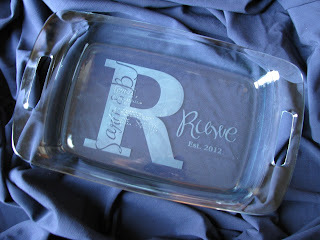 R-17, with first names and date added. 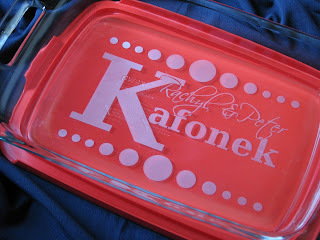 Also this pan is 10 x 15" and also comes with a red plastic lid from Pyrex. 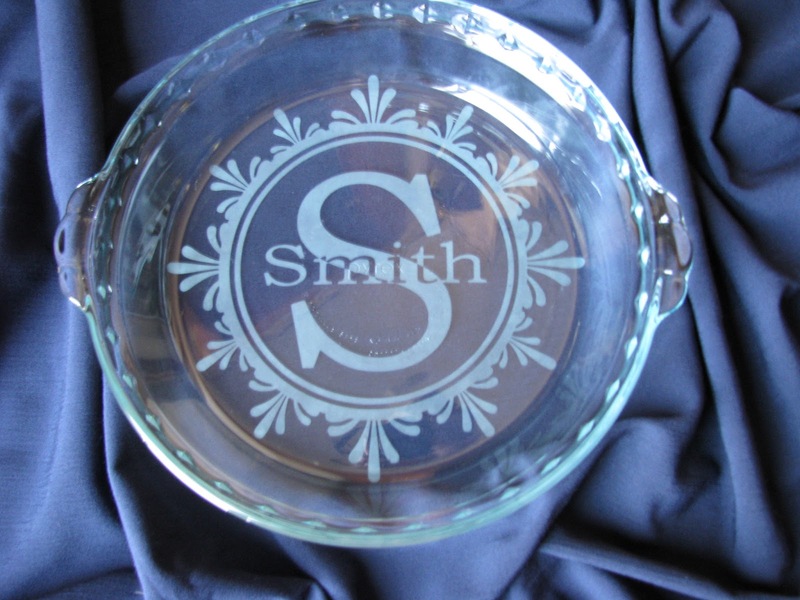 S-12, First names and date added. 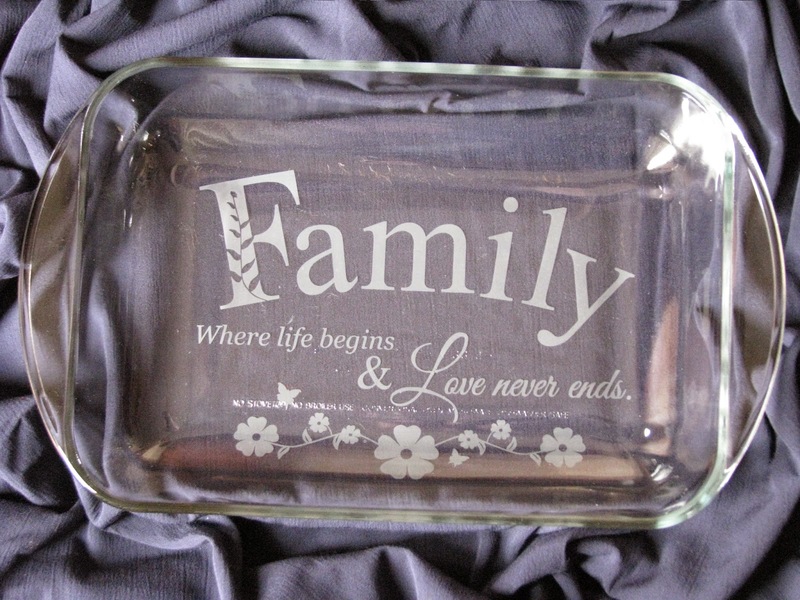 All casserole dishes come with lids, which make it perfect to take along to family gathering or church dinners and know you're returning home with your pan. 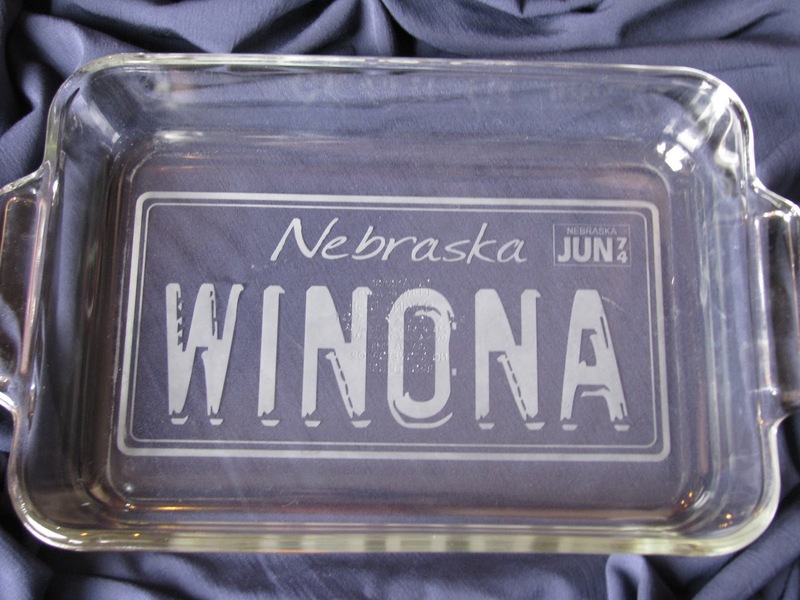 License plate design - if you've never gotten a personalized plate for your car and always wanted one, now you can get the plate of your choice. 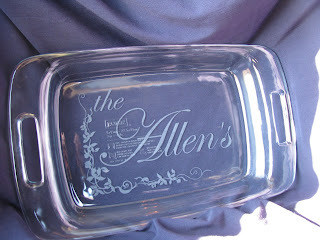 And you don't have to be restricted to seven spaces either. 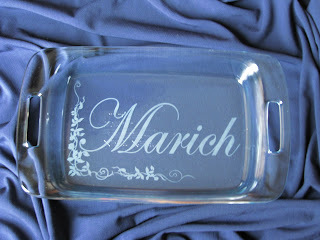 Don't forget you can put the month and year of your choosing as well. 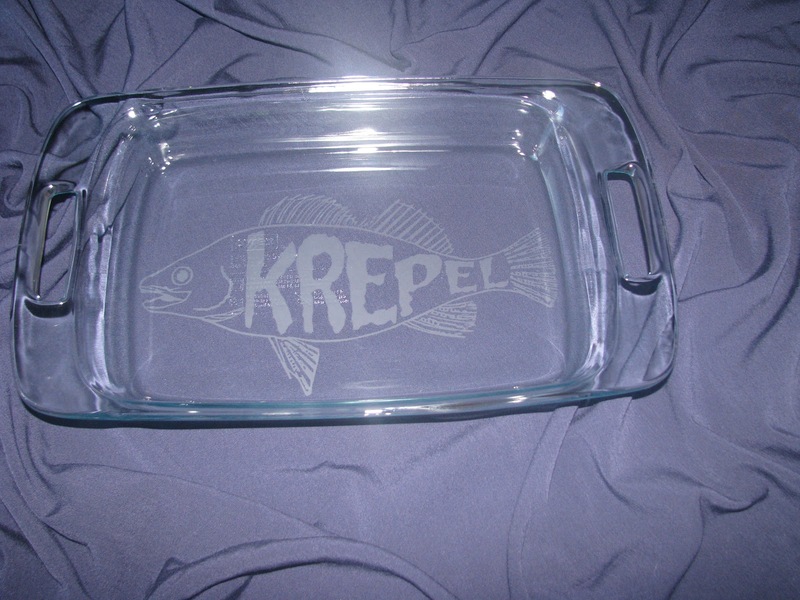 Finally a non-personalized design for the trifle bowl. 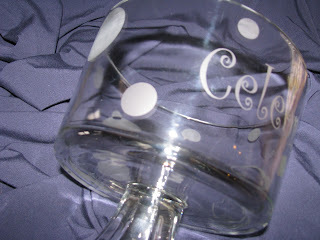 More to come for sure! 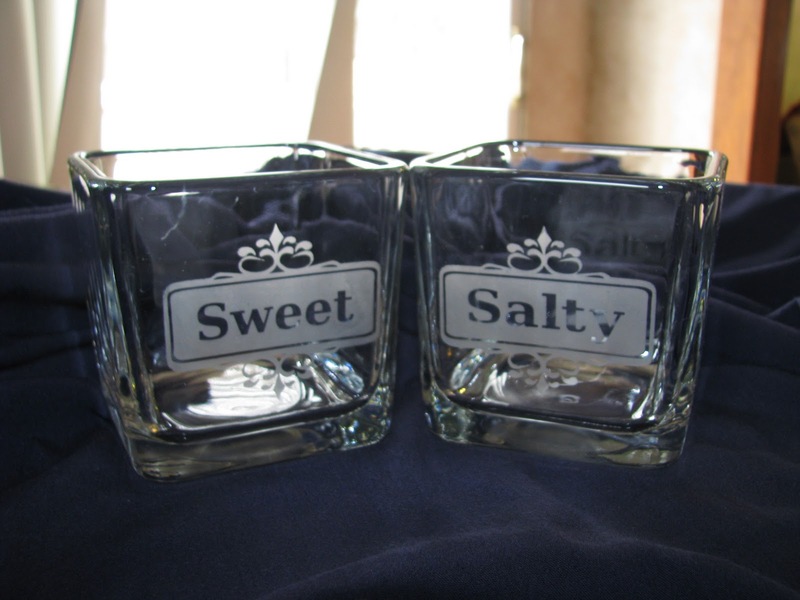 Sweet & Salty on square candy dishes. 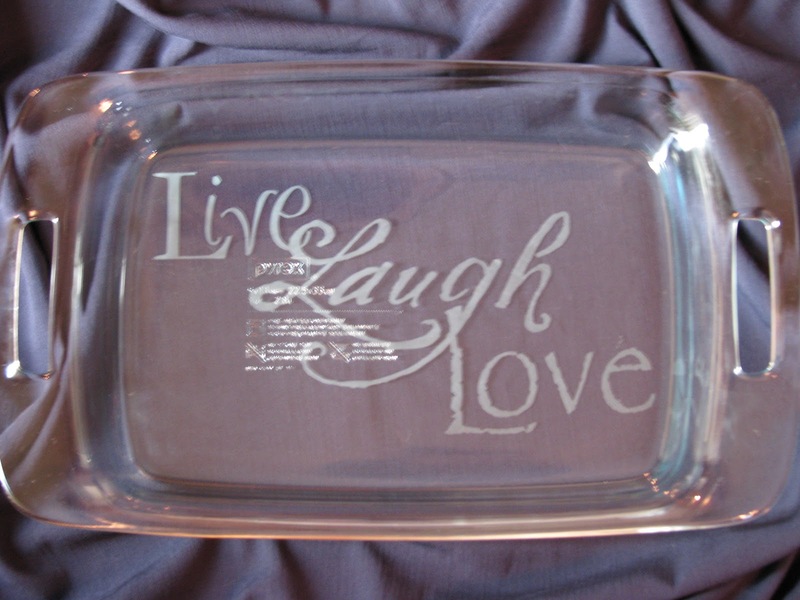 Some of the first pan designs created! 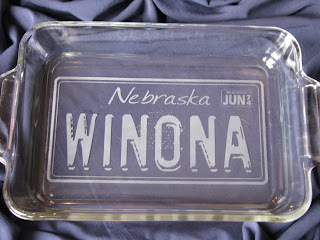 Here are some photos of recent jobs I've done for myself, friends and customers from a previous craft show in Columbus, NE. When summer is over I intend on doing more display pieces. 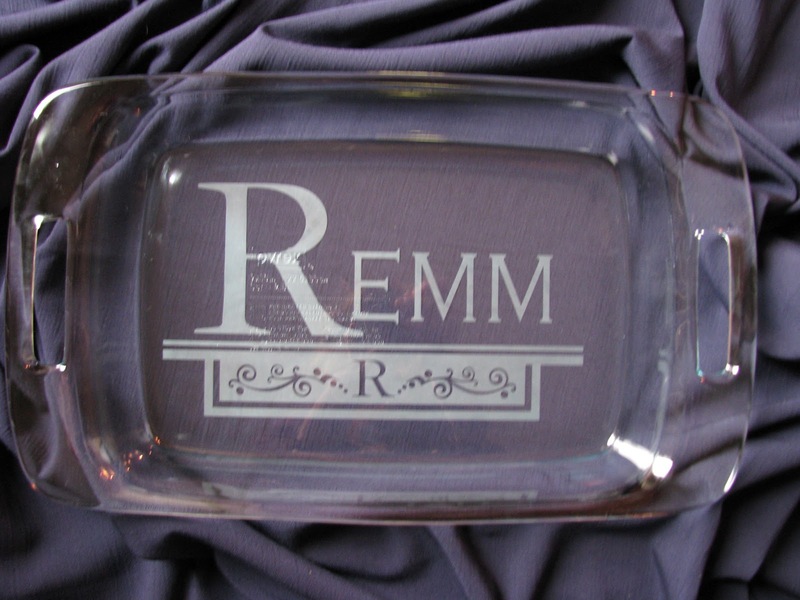 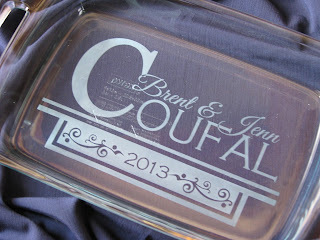 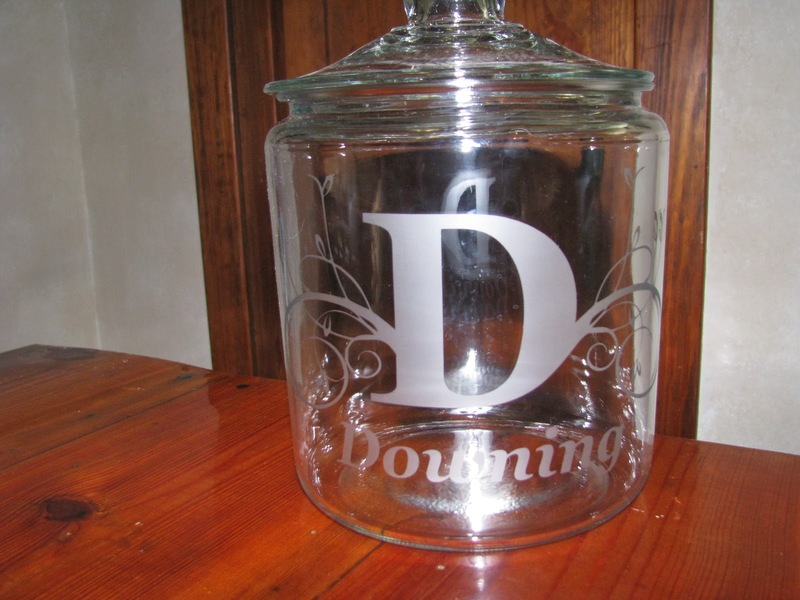 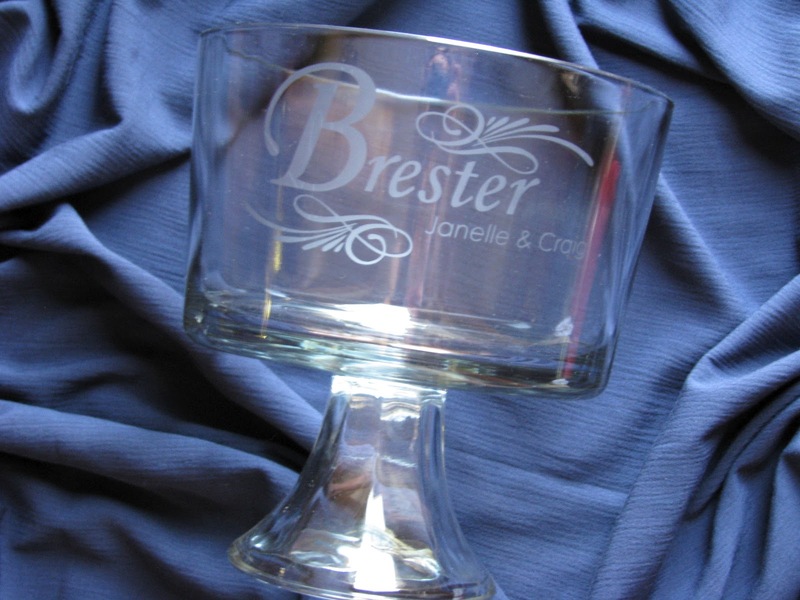 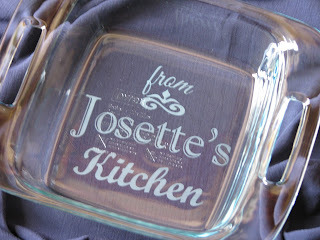 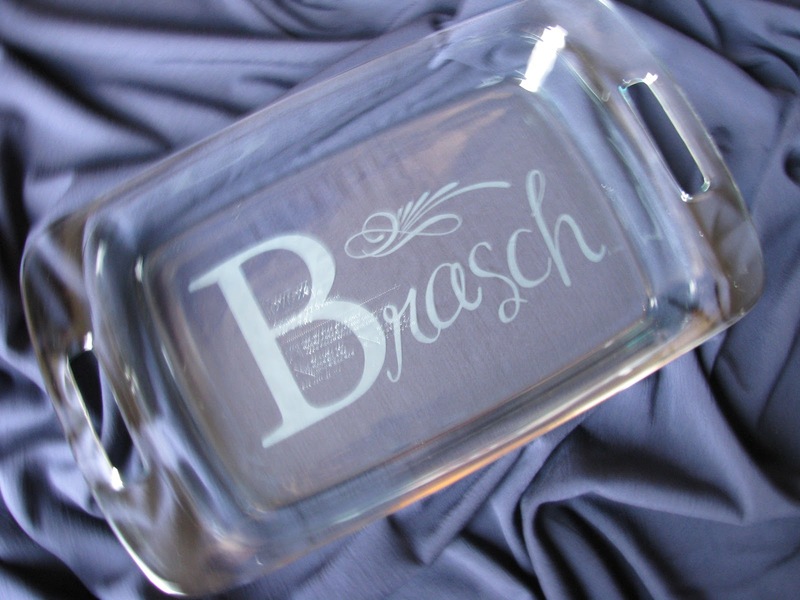 If you're interested in having something etched for yourself or for a gift. 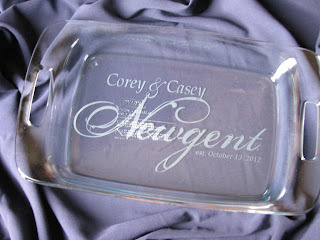 Call 402-750-1015 or email me at designhaven@hotmail.com. 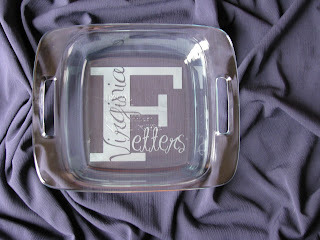 With some letters, adjustments will have to be made, but I think it's a great statement! This was one of the first pans I did (by hand). 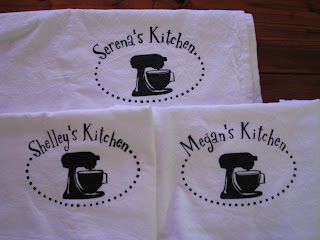 Now I have a machine to do the cutting for me. 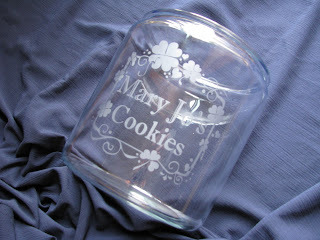 This is technically a "cookie jar". However it is not air tight. 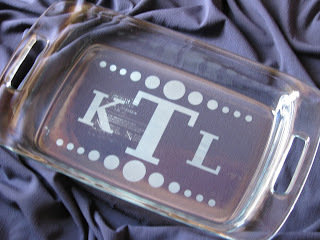 But I do have an alterative option. 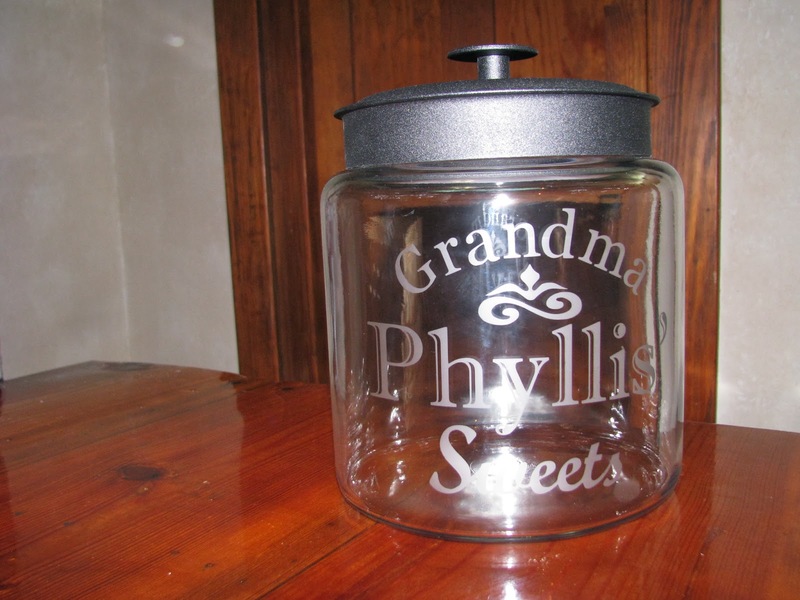 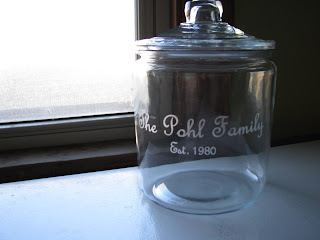 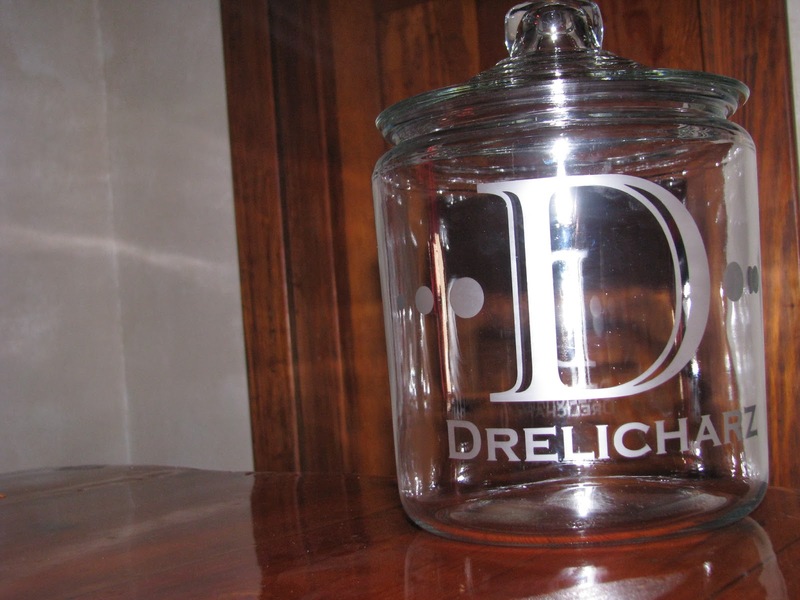 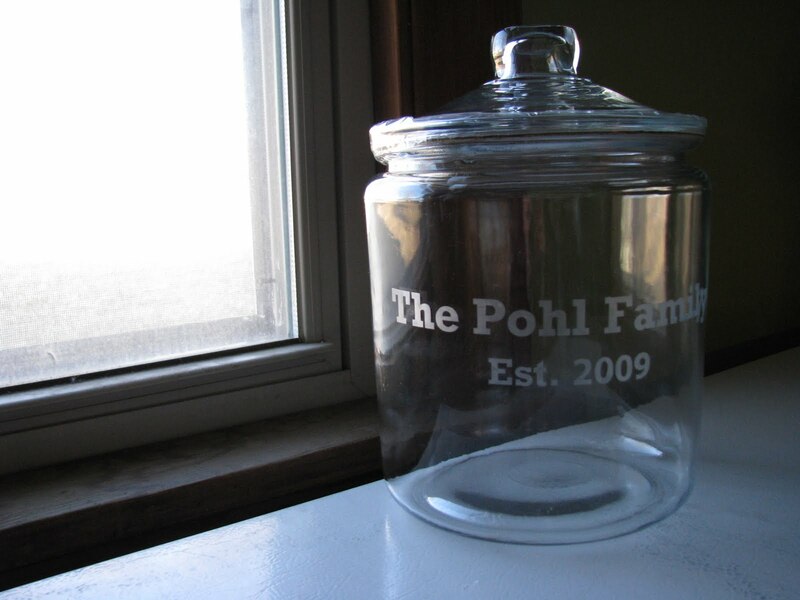 This jar could also be used to store other items, dog treats, cotton balls, a collection of something, as well as a terrarium, the options are really limitless. 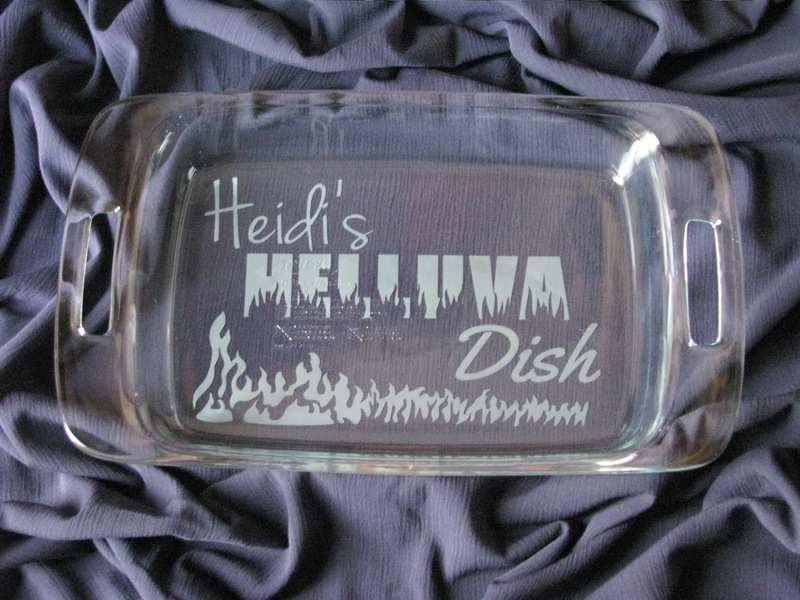 Still working on more designs for you to choose from. 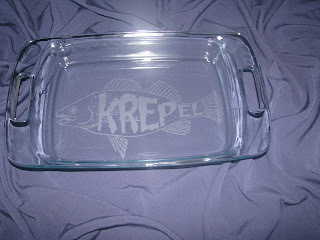 Here it is, in case you weren't sure what it was. 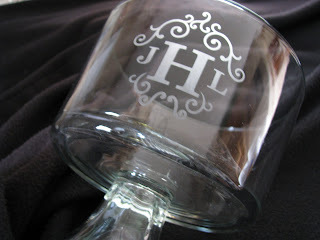 Very elegant and can be decorated a multitude of ways. Another post on that as a later date.